Who Gives A Flap? We Do. In fact, six pounds worth. Flap steak, the unflatteringly named cut, is similar to skirt and flank in that it comes from the less tender regions of the animal. Often cheaper than more popular cuts, this little underdog of the beef world has a wonderful meaty flavor and fine texture when prepared properly. The only place I ever find it is Costco, and they package it in 4-pound lots of strips, which is great for a party, or to break down into smaller parcels and freeze. Of all the inexpensive cuts of beef, flap is one of the most versatile. Like skirt or flank steak, it benefits from marinating and being cooked on high, dry heat, whether grilled, broiled, pan-fried or stir-fried. It’s vital to cut the meat very thinly across the grain, and it is at its best not too much past medium-rare. If it ever threatens to start burning on the exterior before the center is done, you can slide it on over to the cooler side of the grill for some more gently cooking. As with all meat, it benefits from a few minutes of resting before you slice into it. Since its shape, thickness, and proclivity for marinades makes it similar to flank steak, you can use it pretty much interchangeably. Think of it as flank steak’s tastier, sexier cousin. For a little zing to the meal, our enhancers were a delicious Mojo Marinade, followed up by an accompaniment of Chimichurri Salsa. And since fresh corn is just starting to appear in the food markets, we paired the steak with Sautéed Corn Salad with Ricotta Salata and Basil. But let’s talk about the party—the real reason we were “giving a flap.” Eight of us gathered on our patio and started with a Midnight Kiss—the kind you drink, that is. 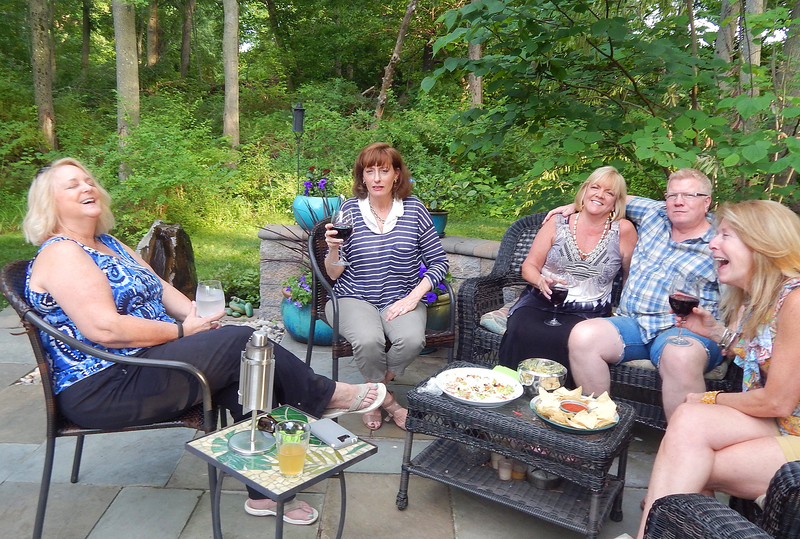 Rosanne brought a premade concoction with blue curacao and vodka (among other ingredients) then topped it off with a bottle of white Proseco, let me tell you, those definitely got the party started! For a pre-dinner nibble, Barb dished out a large platter of bruschetta, a perfect nosh for those drinks! I decided to add a challenge to the festivities with a guess-the-ingredients contest. Since the flap meat was going to be dressed with a chimichurri sauce, I gave each couple a small sample to taste and smell and then list the nine ingredients. The couple with the most correct answers won a gift—and that honor went to Brad and Barb. The guests are hard at work trying to decipher exactly what the chimichurri consists of. As another side dish for the feast, Rosanne contributed a yummy lentil salad surrounded by a mini caprese salad. And what better way to finish a summer meal than with homemade brownies and a choice of three ice cream flavors from Goodnoe’s? Thanks for the finale Fran! Combine all ingredients in a medium bowl and whisk until salt is dissolved. Reserve 2/3 cup marinade for sauce. Put pork or seafood in a glass, stainless-steel, or ceramic dish. Toss with remaining marinade. Cover; chill for 3-8 hours. Remove pork or seafood from marinade, pat dry, and grill. Spoon reserved sauce over meat or fish just before serving. This recipe for a colorful chimichurri sauce can also double as a marinade along with being an accompaniment to all cuts of beef. Combine vinegar, 1 tsp. salt, garlic, shallot, and chile in a food processor and let stand for 10 minutes. Add in cilantro, parsley, and oregano, and grind until well mixed. Drizzle oil into food processor until well combined. Put meat and marinade in a large ziploc bag. I find it helpful to cut the kernels off the cob over a small rimmed baking sheet. Heat oil and garlic in 12-inch nonstick skillet over medium heat. Cook, stirring frequently, until garlic is light golden brown and fragrant, 2 to 3 minutes. Using slotted spoon, transfer garlic to large bowl, leaving oil in skillet. Return skillet to medium-high heat and heat until oil is shimmering. Add corn and sprinkle with 1/2 teaspoon salt. Cook, without stirring, until corn is browned on bottom and beginning to pop, about 3 minutes. Stir and continue to cook, stirring once or twice, until corn is spotty brown all over, 2 to 3 minutes longer. Transfer corn to bowl with garlic. 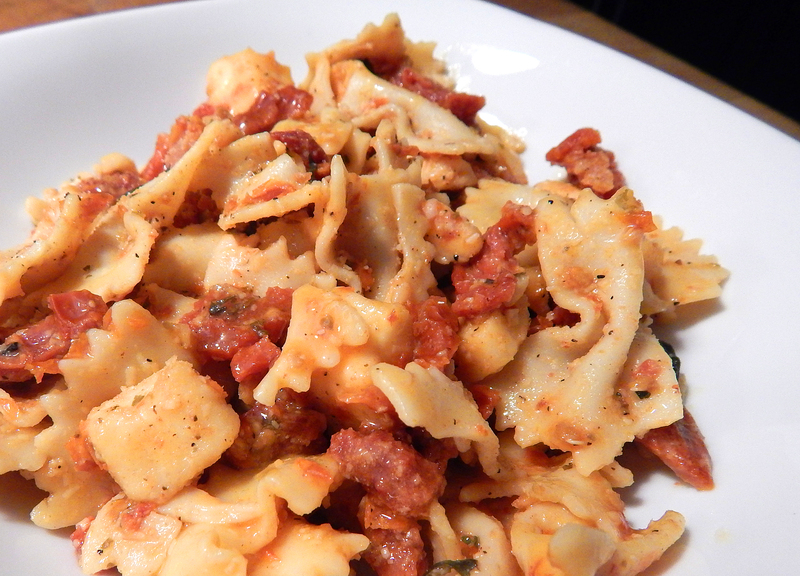 Stir in tomatoes, half of ricotta salata, basil, 1 tablespoon lemon juice, and 1/4 teaspoon pepper. Season with salt, pepper, and remaining lemon juice to taste. Sprinkle with remaining ricotta salata and serve. 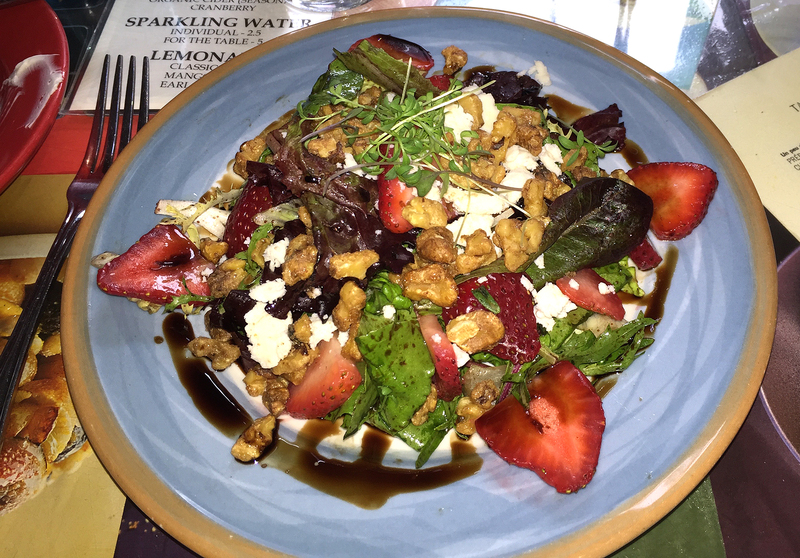 For over thirty years the Spring Mill Café in Conshohocken, PA (consisting of two buildings located next to the Spring Mill Creek) has prepared dishes using the finest and freshest foods available, buying their ingredients from local farms and farmers. The dishes are designed around the availability of fresh and seasonal ingredients and are artfully plated and presented. Our last visit was two-and-a-half years ago with daughter Julia when she was in visiting from LA., and we were seated in the “general store” built in 1831 (above), the site of all our previous dining adventures at Spring Mill. This most recent visit however with the Oldhams, Maria Odilia (MO) and Steve, had us dining in the converted farmhouse (below) across the driveway from the main building. The farmhouse was built in the 1840s as storage and stables for the store and its presiding family; was converted into a living space in the 1950s; and it wasn’t until a few years ago that it also became part of the restaurant. 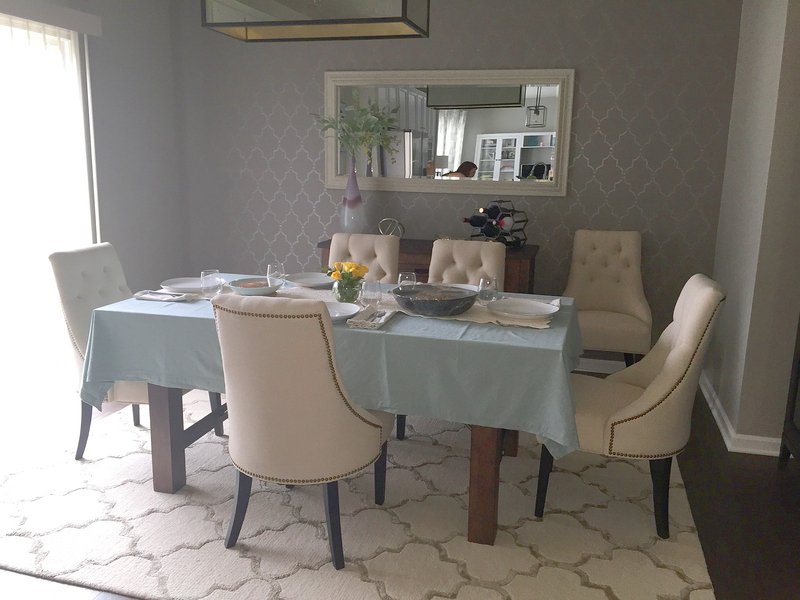 We were lucky enough to have a choice of tables before everyone else arrived and we chose a cozy corner banquette that was flanked on two sides with pews and chairs on the outer edges. Thanks to our waiter Nate for taking our group photo. Their menu is not extensive but well thought out and includes vegetarian options, along with a few nightly specials. So for starters, both Steve and I settled on the soup du jour, a Creamed Asparagus topped with Crabmeat. It was silky and subtle with small chunks of tender asparagus and a decent dollop of tender sweet crabmeat. Russ knew ahead of time that he would be starting his meal off with one of their patés and chose the Truffled Chicken Liver Pâté with a crock of pureed chicken liver, baked with cream, black truffles and brandy, served with sliced baguette, cornichons and whole grain mustard. Maria Odilia decided on the Salade de Betteraves, plated with roasted golden beets with baby kale, Bucheron goat cheese, and a pomegranate vinaigrette. expecting red beets, you was pleased to see the golden variety on her plate. By this time, the entire restaurant was filled and conversation scaled up a couple of notches. A topic of discussion became the circular stairway in the center of the room leading to the second floor and the only bathroom—consisting of a very tiny sink, but large clawfoot blue bathtub—apparently a leftover from it’s days as someone’s living quarters. As the evening wore on, the traffic up and down those winding stairs became quite a side show. Steve’s initial entrée choice was the mushroom vegetarian option, but quickly made an about-face and chose the Lapin au Pruneaux, a Stony Hill Farm braised rabbit with red wine, mushrooms, and fingerling potatoes, garnished with a lardon and prune tapenade served in a large bowl. Both MO and myself were on the same wavelength and opted for the Espadon aux Capres, which was a grilled swordfish steak with a caper fennel butter, served over a winter root vegetable puree. Eating with your eyes first, each dish was a feast to behold, but MO complained loudly about the lack of color on our swordfish plates. Being a fellow artist I had to agree. Luckily, we had ordered a side of the vegetable du jour which happened to be haricot verts, so we quickly remedied that faux pas with the addition of some green. Otherwise, totally scrumptious! Well, no surprise that Mr. Russ got the Duck Breast Cassoulet, one of his top faves. The duck breast was seared with a pork and duck confit, and accompanied by white beans, sausage, and a tomato sofrito. Let’s just say, it’s still sits in a place of honor near the top of the list. All-in-all, a lovely evening that was nearly three hours long. After we finished dinner, we took MO and Steve over to the main building to check out the digs. Nearly 10 p.m., it was already set up for the next day and deserted of patrons (except for the manager who was tending the books). An interesting fact: they cook all of the meals in the main house and have to transport any orders for the farmhouse, outside across the driveway. We wondered aloud how dicey that must get during bad weather… Now time to finally bid each other adieu for our 30-minute, but easy ride home. Hear Ye, Hear Ye: To all my vegan/vegetarian friends and wannabes—or even the meat eaters who just enjoy great tasting food—here’s a quaint dining establishment worth your while. 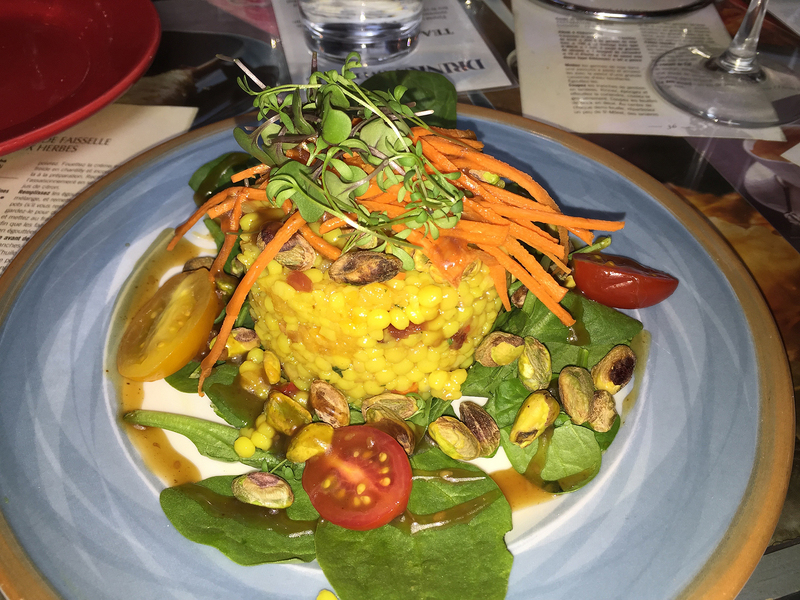 In Jenkintown, PA, a neighborhood of the Philly suburbs (and where Russ was residing when we met), this 16-seat enterprise, Flora Vegan Restaurant, is apparently one of the area’s most sought-after vegan spots. Originating as the vision of four high-school friends who shared a passion for food, they wanted to create a place that was intimate and comfortable, located in a small urban neighborhood, used locally-sourced ingredients, and served healthy dishes. And they certainly succeeded! Opened in Fall 2014, Flora is an award-winning culinary BYO treasure where seasonal, local produce takes front and center stage at this self-proclaimed “vegetable restaurant.” Their prix-fixed menu changes seasonally to reflect the freshest produce and ingredients available, with an aim to provide an exceptional meal and experience fit for all diners, whether they are vegan, vegetarian, omnivores or carnivores. 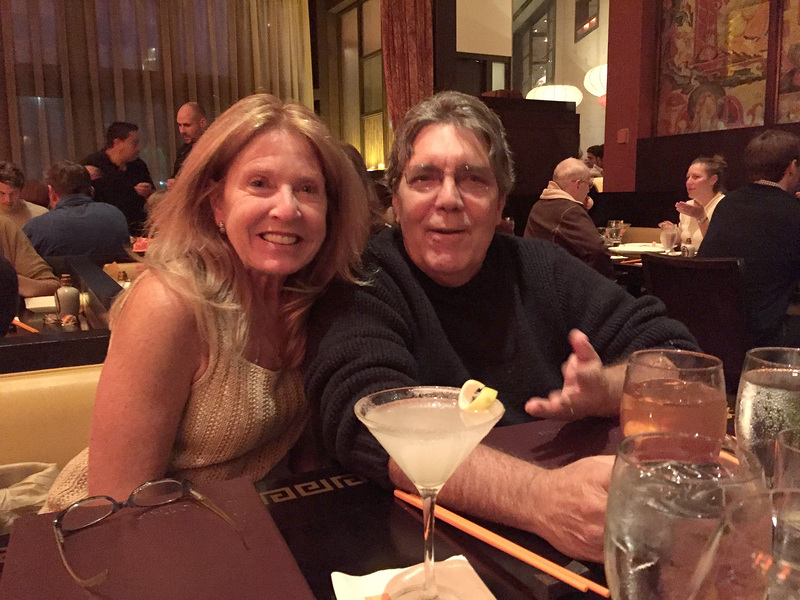 After several months of trying to connect for a dinner out with friends Lisa and David Greenspan, below right, we nailed down a date in early May. Knowing Lisa was a vegetarian, it provided a good excuse for Russ to make a res at Flora, a place we’ve both been wanting to try for quite some time. With so few seats, we were lucky they could accommodate us on our preferred date and time. Arriving at practically the same moment, we were seated in a cozy corner nook at the only available table, by managing owner and one of the four founding members, Dan Brightcliffe, who played host and waiter to the fully packed room, albeit a small one. We were offered a choice of sparkling water or tap, charmingly served in mason jars, and were so busy chatting that Dan had to come back three times to get our order when we hadn’t even as much as glanced at the menu. 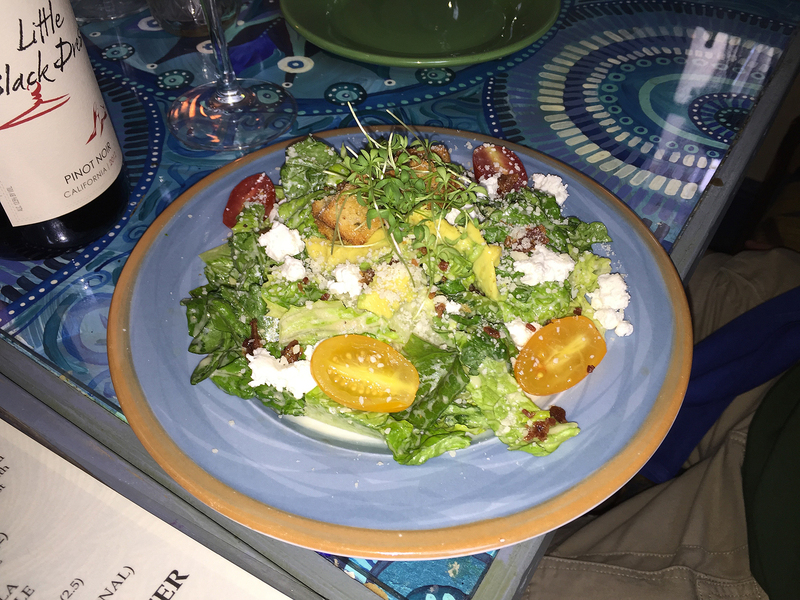 With no ala carte menu, the restaurant is a reasonably priced prix-fixe spot that offers three and four course options served on small plates, but while the dishes may be petite (a few absurdly so), we didn’t end up going home hungry. Our plan of attack was ordering two four-course meals, and two of the three-course options. Iceberg Salad: Crispy Shallots, Pickled Cauliflower, Carrots, Croutons & Creamy Herb Dressing. Not shown, Brussels Sprouts Three Ways: Raw, Salt-Wilted, Charred with Spicy Sriracha Vinaigrette & Sesame Seeds. With each category offering four options we decided to get three choices, shown above, from the first course (no one got the Garlic & Spinach Soup figuring it would be too awkward to split between four people.) From the second course menu we went for one of everything, shown below. On to the third course where we selected three of the four options, omitting the Spaghetti with Asparagus, Breadcrumbs & Lemon, and doubling up on the Spicy Chickpea & Vegetable Vindaloo. Our hands-down favorite was the Ragout of White Beans & Artichokes with Carrots, Spinach & Crostini. Each course was a sensual assault to our tastebuds! As we savored every morsel, conversations ran the gamut from best-loved restaurants of different ethnicities, to cooking classes (they did one in Istanbul, us in Spain), to how Lisa and David met (she was the pursuer), and our mutual love of gardening. Now Russ considers himself a bit of a crème brulée aficianado and therefore zeroed in on the Banana Crème Brulée with carmelized bananas as one of the desserts. David on the other hand loves carrot cake and chose the Carrot Pudding with carrot cake spices, vegan cream cheese icing and candied almonds. 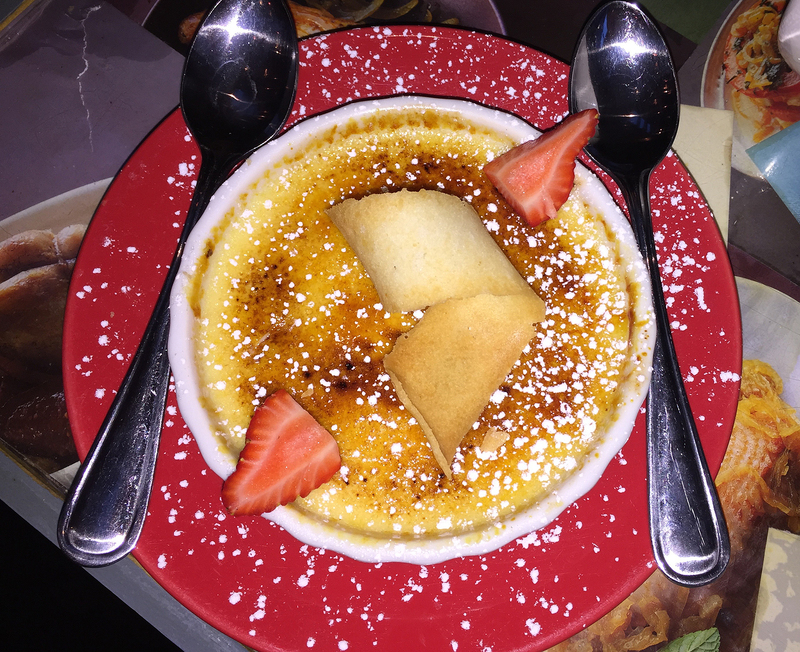 Lisa adored the crème brulée, and while I had a tiny sample, it didn’t appeal to me at all, nor was Russ very fond of it. After all, it’s a daunting task to make a custard-based dessert without dairy. The pudding seemed to make points with David, and Russ really enjoyed it also, but while I didn’t try it, I found it was the more appealing of the two. The holiday season is usually a time to socialize with family and friends and so it was that I reconnected with long-time friend (and past boating comrade) Eileen, below left. We’ve been meeting over lunch between Christmas and New Years for around 20 years, conceivably longer. Often her sister Barb will join us, as was the case this season. The original part of the building was constructed in 1889 for Yardley National Bank. The 8,000-pound vault door was installed prior to the construction of the building and no changes have been made to its design in over 125 years. The vault is now used as a beer-conditioning cellar, how cool is that! They provide an atmosphere more akin to the speakeasies of Philadelphia than to a traditional brew pub. You enter through a “faux vault entryway,” and immediately notice that the entire brewery and wood-fired kitchen oven are completely open to view. The brewery sits directly behind the bar and the kitchen is adjacent to the dining tables. Their décor is a striking, unusual blend of regal bank, stark industrial, old-world, and modern. Luckily Eileen, who arrived first, had the where-with-all to get our name on the wait list because for 2:00 on a Tuesday afternoon, it was packed! Barb arrived minutes after me, but we still had to wait for about 15 minutes before we were seated. On my way in I noticed they were adding an extension out back into the parking lot. Barb disliked her first choice of beer so I suggested asking for a small taste of her next beer before she committed. The waitress brought two samples. For their second choice, Eileen and Barb decided on a flight of 5 beers. It worked out well because if one sister didn’t really like one of them, the other seemed to. Me, I stuck to a glass of Merlot. Their menu rotates seasonally and is intentionally focused yet varied with unique gastro-pub dishes. While not gigantic in scope, they offer a small selection of tapas, salads, sandwiches, pizzas, and desserts. Everything you find on the menu is either made in-house or sourced locally, nothing is ever frozen or reheated, and every “in-house” ingredient is made fresh daily. I pretty much made up my mind right away and opted for the Chicken & Greens salad. My companions had a more difficult time selecting, but finally both chose the Buffalo Chicken Salad(although Barb nixed the bleu cheese). Barb initially contemplated a hamburger but was concerned over the doneness because our waitress didn’t make it sound like you could get it cooked to your liking, odd as that seems. The menu only lists one burger, the Grass Fed Burger: an 8 ounce hand-formed patty, with white cheddar, butter lettuce, heirloom tomato, red onion, red pepper-garlic aioli, on a brioche. I noticed one male patron ordered that and it took all he could do to open his choppers wide enough to take that first bite! BUFFALO CHICKEN—Roasted chicken, arugula, pickled red onion, cucumber, celery, yellow pepper, blue cheese, creamy dill vinaigrette. CHICKEN & GREENS—Poached pesto chicken, chick peas, arugula, English cucumber, celery, haricot verts, heirloom cherry tomato, shaved parmesan, and roasted tomato vinaigrette. I pretty much ate my entire salad and would definitely order it again. After Barb took her first bite, she was appalled that there might be mayo in it, and we figured it must be part of the creamy dill vinaigrette, so she more or less picked around it, not consuming most of the greens. Around three years ago Russ and I had stopped in for lunch and split an appetizer order of the Buffalo Cauliflower consisting of buttermilk cauliflower, house buffalo sauce, sweet pickled celery, and chive sour cream, and as I recall we both really liked it. If I’m not mistaken our other choice was a Margherita Wood-Fired Pizza. They now seem to have more selections as far as the pizzas go. According to their website, they brew twice a week with each batch rarely lasting more than a month. The beer lines that run directly from the serving tanks behind the bar may be served via draft (traditional CO2), nitro (think Guinness-style), or cask (low-carbonation, warmer temperature, English-style). Oh and thanks Eileen for treating us! A gentlemen customer offered to take our photo in front of the wine vault as we were leaving. Located on the banks of the scenic Hudson River, Overlook on Hudson is just minutes from West Point and less than one hour from New York City. First owned as a summer retreat by financier JP Morgan, the current structure was built on the original foundation of Morgan’s 1880 mansion with the fireplaces and expansive patios still part of this lovely B&B. Our view of the Hudson River as we arrived at the B&B during “Leaf Peeping” season. During the 1970’s, Overlook on Hudson was home to world-renowned recording artist Billy Joel where he composed his popular song, “New York State of Mind.” Inspired by the sweeping views of the Hudson from the large window, “The Piano Man” composed and played a number of songs here, most famously his Songs in the Attic album. You may recall that we booked this weekend getaway back in early September when visiting Merry Sue and Fred at their “Baum Shelter.” Our initial intentions centered on a long weekend in the Finger Lakes, but because folks are very serious about their Fall foliage “Leaf Peeping” in the Northeast, everything in the area was booked solid through Thanksgiving! Not wanting to give up on the idea, I suggested looking at places along the Hudson River, and that’s how we discovered Overlook on Hudson. While researching the B&B, we noted every review was rated 5 out of 5—can’t beat that! With only five guest rooms for rent, the atmosphere lends a cozy and tranquil vibe, just what we were looking for. Our room the “Eagles Nest” had a great view of the river. Russ and I booked the “Eagle’s Nest” with spectacular views overlooking the pool and the river valley—although late October is certainly NOT pool-weather in New York. The Baum’s chose the charming “Cadet Room” boasting of historical art works and memorabilia representative of life as a cadet in the United States Military. There are even photos of the Army/Navy “goat stealing,” a tradition dating back to the Fall of 1953. Russ stands on the back patio with a cup of coffee. Views of the formal living room showcasing the original JP Morgan fireplace and tiles that survived the 1952 fire because they were in the basement. Husband Jim was breakfast chef, while Roxanne graciously served guests several courses on beautiful Ralph Lauren china with sterling silver cutlery. They even made accommodations to the menu based on Russ’s wheat intolerance. For dinner on our first night we planned a casual feast in Harriman, NY at Angelo’s Sicilian Trattoria, a family-owned and operated BYO. As we pulled up curbside, Merry Sue uttered an audible “Oh no” because we saw absolutely no one in the dining room. But after we disembarked from our vehicle we could see the other half of the restaurant was in fact, jam-packed! Luckily Merry Sue had made reservations and our corner table awaited us. Brightly saturated walls in several different hues, were lined with a chair railing made of split wine corks. The atmosphere was cozy, yet loud, but the waitstaff were all friendly and very attentive. Yes, because everything is made fresh and to order, there is a bit of a wait for your meals—with a few missteps along the way such as forgetting our side salads until asked, an extra cup of ice until asking for twice, and another iced tea. But given the ginormous sizes of all our delicious entrées at reasonable prices, all was forgiven—not to mention a ton of leftovers! 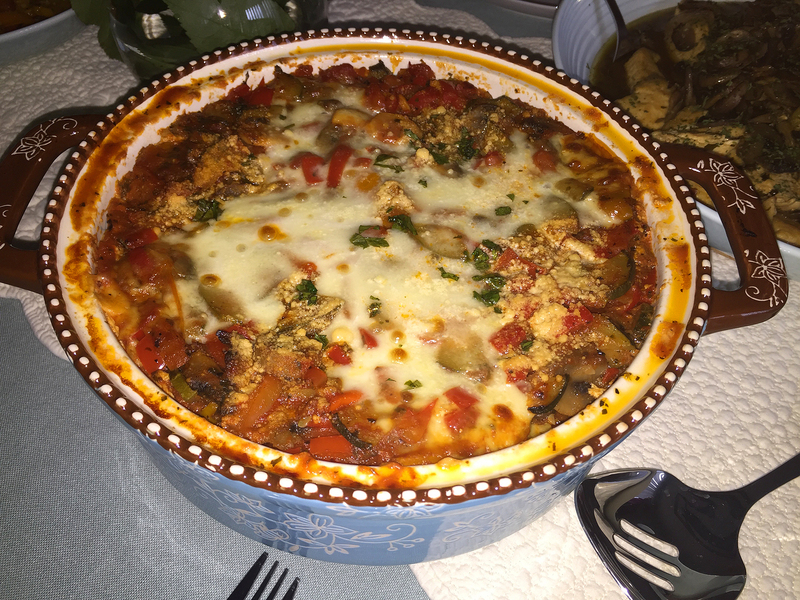 For starters Lynn and Russ shared a fabulous appetizer of Eggplant Rollatini. Merry Sue and Fred made quick work of their Meatballs in Grandma’s Gravy selection. Our entrees were Spaghetti with White Clam Sauce (with extra clams) for Merry Sue, Eggplant Parmigiana for Fred, the Pork Osso Buco with polenta special for Russ, and Chicken Marsalafor Lynn. Saturday morning was spent in New Windsor, NY roaming the grounds of the well-known Storm King Arts Center highlighting large sculptural pieces by such acclaimed artists as Alexander Calder, Dennis Oppenheim and Maya Lin. They are sited across 500 acres of fields, hills and woodlands against the backdrop of Storm King Mountain. The Hudson River Valley and Orange County, NY have one of the oldest wine country areas in America. Our Saturday afternoon excursion was to Brotherhood, which has the unique distinction of being “the” oldest winery in the U.S. After our wine tasting and consequent wine purchases, we were ready for lunch at their Vinum Cafe which occupies the ground floor of the original winery building circa 1839. While the food was more than passable, the wait and service left a lot to be desired! Fred snaps a photo of the three of us during the wine tasting; then Merry Sue and Fred pose in front of a large wine casket. Late lunches at the Vinum Cafe included an Imported Cheese Platter, BBQ Pulled Chicken sandwich on a ciabatta roll with sweet potato fries and arugula, Steak Frites Salad, and a Crab Cake with cajun remoulade, mesclun salad and sliced cucumbers. We relaxed back at Overlook for several hours with books, naps, and/or a game of scrabble before heading out to dinner at the Hudson House River Inn. Built in 1832 and operated as a hotel since then, it is located on the serene waterfront approximately one hundred feet from the Hudson River in the quaint, antique shopping village of Cold Spring; and is currently on the National Register of Historic Places. Overall the food was very good with a few exceptions. Russ and Fred loved their Rack of Lamb special, and Merry Sue thought her roasted garlic crusted Diver Sea Scallops dinner was superb. I ordered from the “Price Fixe” menu thinking it would be a better deal than selecting a steak a la carte. And while my Certified Angus Sirloin topped with bordelaise sauce was cooked perfectly medium-rare, the size was underwhelming, especially considering the hefty price tag with a $4 upcharge. At that cost, I would have appreciated taking home some ample leftovers. From the top: the Rack of Lamb entrées for Fred and Russ, Diver Sea Scallops for Merry Sue, and my meager, overpriced Certified Angus Sirloin. 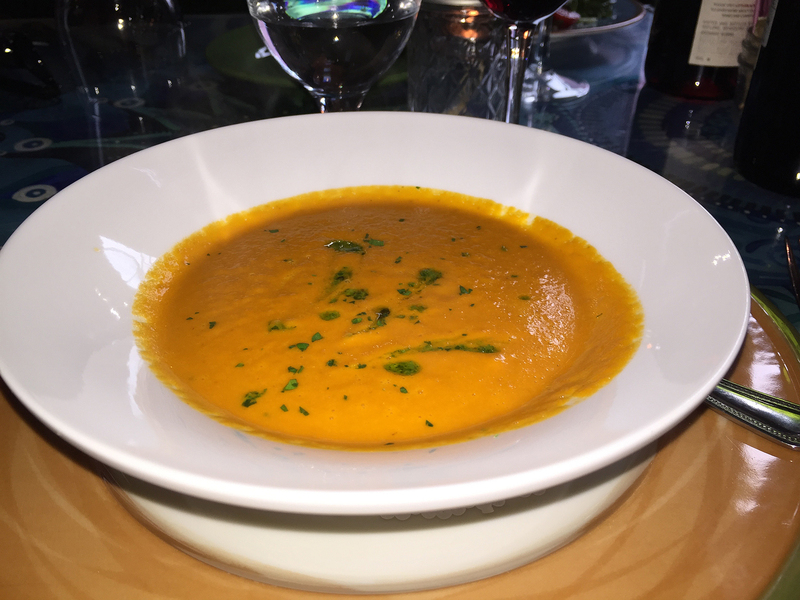 I’d be remiss if I didn’t mention the Lobster Bisque that Fred and Russ enjoyed as appetizers, and a tasty Arugula and Golden Beet Salad I chose as part of my three course offerings. Merry Sue was the lucky recipient of my last course—dessert. Since I don’t indulge in dessert, she was more than happy to oblige and chose the New York Cheesecake with raspberry coulis; savoring every morsel and gave it three thumbs up! A side note: a young couple also staying at the Overlook, and with whom we had shared breakfast that morning, came in and were seated at the table next to us. From our vantage point Russ and I could see—and hear—that they were having a major spat all through dinner. According to Roxanne, back in the 70’s when the Piano Man and his first wife Elizabeth rented the house for two years, Billy had his piano “in the attic” which the Donnerly’s later fixed up into a charmingly outfitted suite decorated with numerous artifacts referencing the legendary rocker. Thus the title of his well-known album “Songs in the Attic” which ranks among his very best work. The panoramic view from the Billy Joel Room upstairs window. A framed Baby Grand hung on musical themed wallpaper. The music theme continues on a tea set. A collection of framed Billy Joel album covers. A planter was crafted from old LPs with titles from various Piano Man songs. Well, they were certainly some of the best of times for the four of us. So when visiting the area, don’t “overlook” this gem on the Hudson! Justa harda working man trying to live the American dream! So says Pasquale Palino, (formerly of LaStalla, one of our Newtown faves), executive chef at Vecchia Osteria. It’s a wonderful Italian, bring-your-own, local, family-owned gem, conveniently located in the heart of Newtown, Bucks County, PA. The menu is authentic Italian cuisine—each dish made with the freshest ingredients and cooked to order. Who can argue? I believe it’s been around for several years now so it’s a small wonder that we never heard of it until very recently. 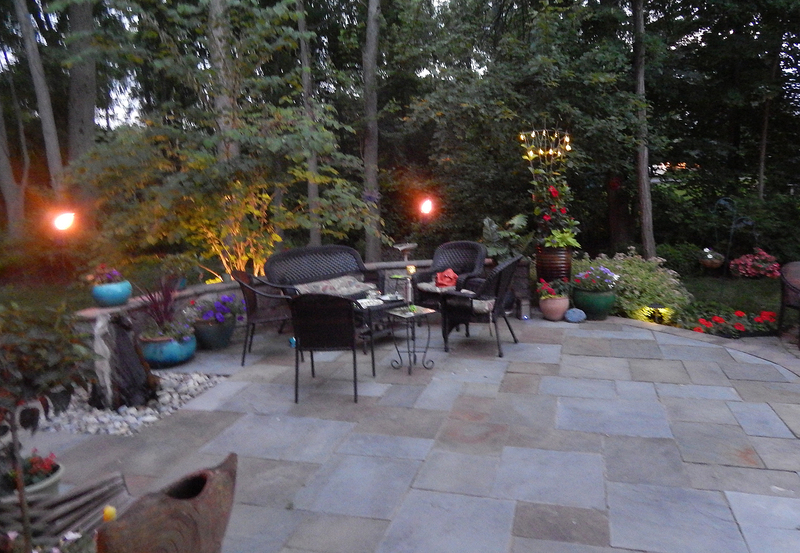 During the warm weather, they have a huge outdoor seating area which we looked forward to enjoying with friends Rosanne and Gary on a recent Saturday night. However, Mother Nature, who has been cranky the entire month of May, was still not cooperating, so we were seated inside. 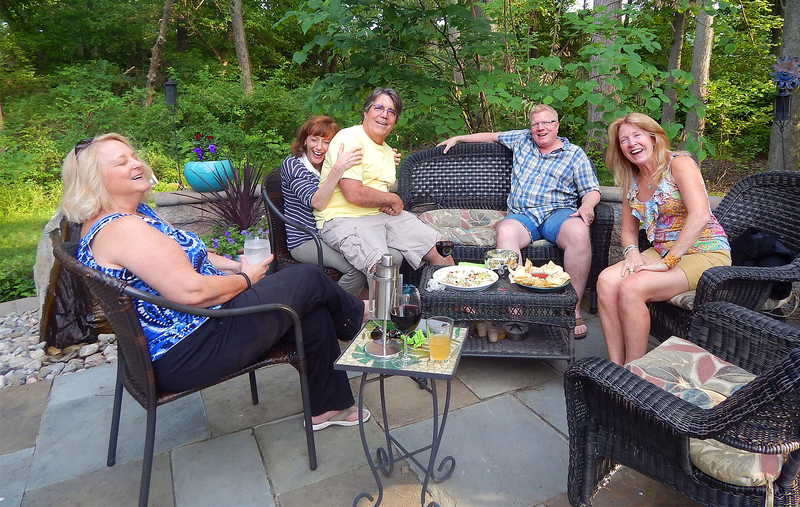 But before we hit the road, Rosanne and Gary stopped by our digs for cocktails and hors d’oeuvres. It was a brief visit due to a time mix-up but we did get to enjoy an antipasto platter that Rosanne cleverly assembled (in a purple ceramic oblong basket from Italy, no less.) And earlier in the day I spotted a goat cheese and yogurt dip recipe in my Rachel Ray magazine that would pair perfectly with some seasonal fresh radishes. Forward ho! Despite the nasty weather, it was packed when we got there, every seat was taken—a testament to Pasquale’s talents. If you plan on going, definitely call for reservations. Nearly every inch of wall—and ceiling—was covered with corks, framed photos, bunches of grapes, and light fixtures made of green wine bottles. And parts of the restaurant had copper tin ceilings for an old-world effect. The following images were taken from their website to give you a visual snapshot of the place without people. 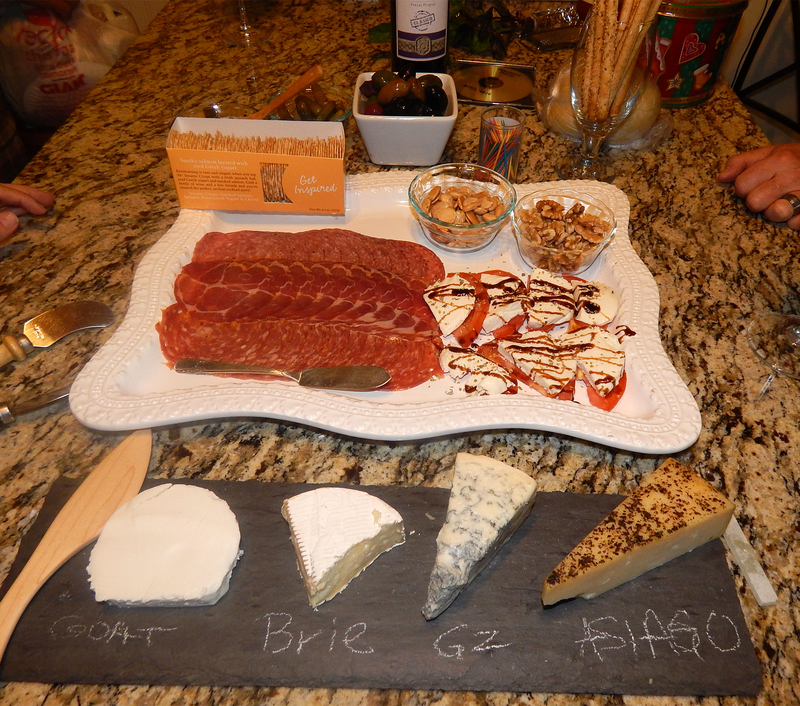 Yes, we did imbibe in some appy’s at our house just a short while ago, but we had to sample some of theirs because, after all, I needed fodder for this blog! In that vain, the Zarrilli’s split a plate of Calamari with Red Sauce, and the Mr. and I enjoyed the Roasted Red Peppers & Mozzarella. Surprisingly we were all on the same page as far as entrée choices in that we each selected a veal dish (all veal entrees are served with the vegetable of the day). Consider them writ in stone, as they say! Always leave, though, not linger, when you are done! 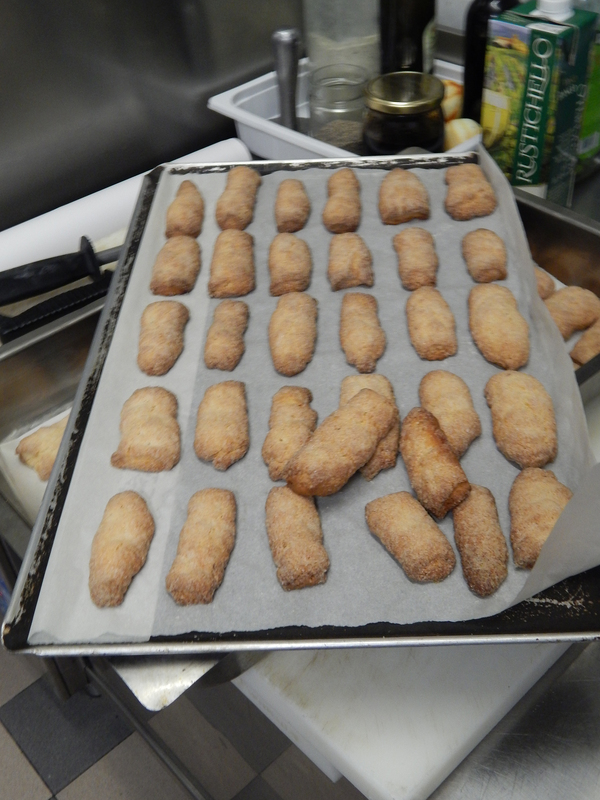 Everythings freshly made, but that takes a while! About overdrinking, FORGET ABOUT IT! As we headed out the door for the car, the weather was even worse than when we came in! But we’ll be back, and hopefully dining al fresco! During the late 1980’s and all of the 90’s, Barb and Brad (B&B), and Fran and Grant (F&G) were close neighbors of mine (and my ex) when we all resided on Manor Lane in Yardley, PA. After the devastating floods in 1996, F&G were the first to move out in 1997. B&B followed in 2000, and I finally left for drier pastures (with Russ) in 2011. But friends we remained. 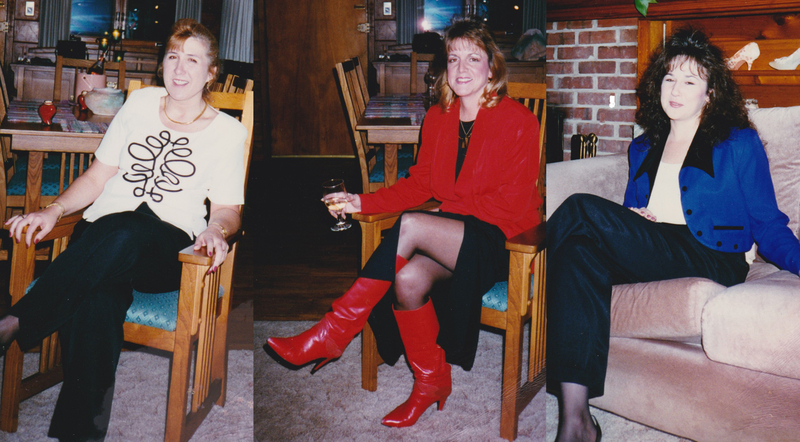 And so every Christmas season the three couples get together for some holiday cheer, and this year it happened to be at our place, Casa H.
The three ladies, from left, Barb, Lynn and Fran, enjoying a cocktail at my old house back in the mid-90’s before going out for a Valentine’s dinner. Picking a date that’s convenient to all is rather tricky, but I was able to narrow it down to the Friday before Christmas. Problem was, Russ and I were in Harrisburg for a few days, not returning until late afternoon on that same Friday. So the meal had to work within the timeframe allotted, which brought to mind Russ’s famous Braised Pork N ‘Kraut meal that could be made days ahead of time and simply reheated. The surprise hit of the night was the always tasty and versatile, “go-with-everything” Celery Root Puree courtesy of Dorie Greenspan (recipe follows.) 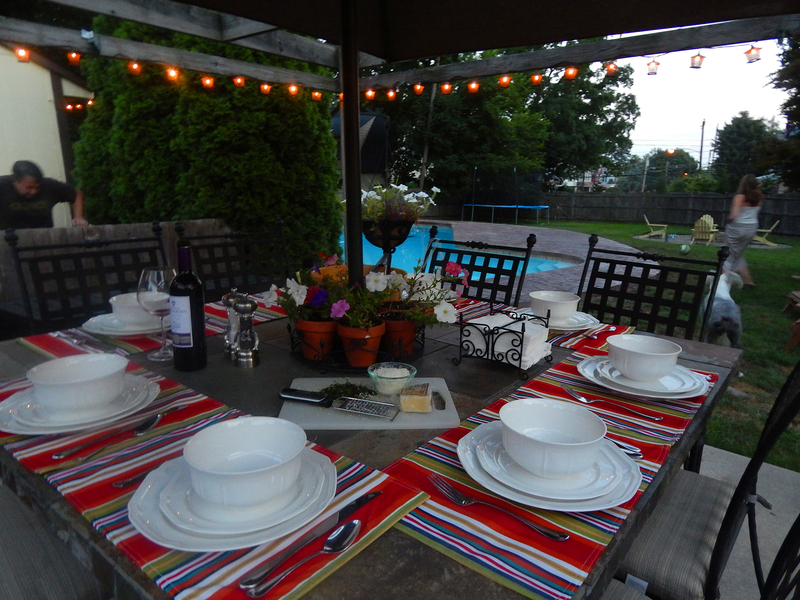 Our other sides included homemade Solebury Farm Apple Sauce, and a festive side salad for starters. 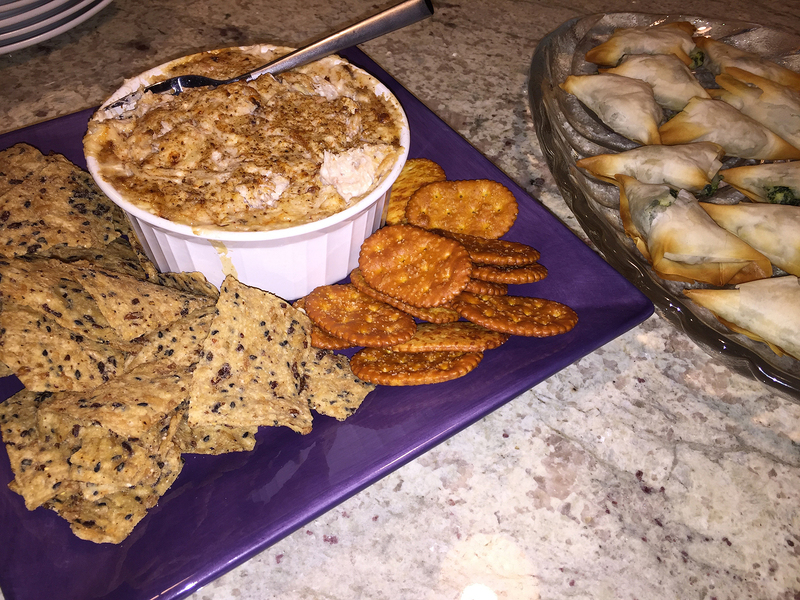 Warm crab dip and crackers, and spanakopita triangles for appetizers. Barb was in charge of appetizers, and she made a hit with her warm crab dip and spinach spanakopita wedges. If you’ve never had them, they are little pies stuffed with spinach, onions, cheeses and herbs that are all enfolded by crispy, flaky phyllo dough—tasty little critters! We caught up with each other over cocktails, enjoying the fire (the weather had actually turned cold after all of the unseasonable 60 and 70 degrees we had been experiencing), before adjourning to the dining room for the festive starter salad. 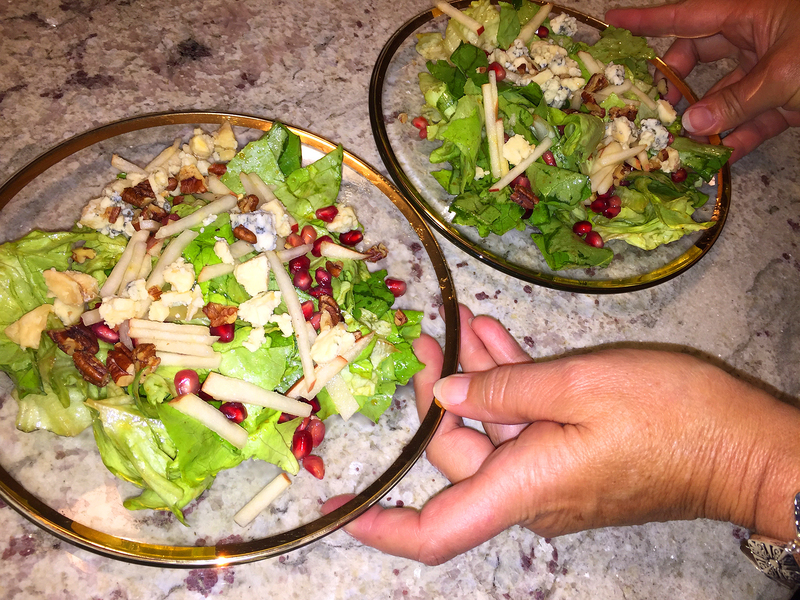 The bed of Bibb lettuce (also called limestone) was tossed with a sherry vinaigrette, then dressed with sliced apple matchsticks, pomegranate seeds, toasted pecans and some aged Stilton crumbles. 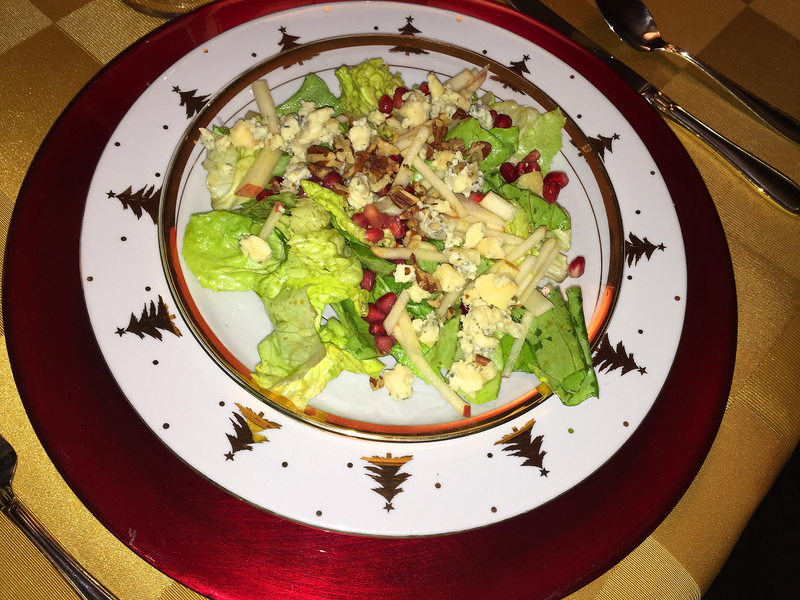 The reds and greens on the salad lent a festive Christmas touch. Next up came the main course and sides. Keep in mind that while all we had to do with the Pork ‘N Kraut (recipe follows) was reheat it at a low temperature for a few hours, it is initially a time-consuming dish, as noted in the directions below. But like many dishes (chili comes to mind), the flavors are more enhanced the second time around. This would make a great meal for New Year’s Day, because the custom of eating pork on New Year’s is based on the idea that pigs root forward into the ground which symbolizes progress. And thanks to its rich fat content, it signifies wealth and prosperity (although this pork meal is not high in fat.) Cooked greens, which look like folded dollar bills, are also believed to bring money and prosperity for the new year. Thus, cabbage is made into sauerkraut and served alongside pork in many cultures. 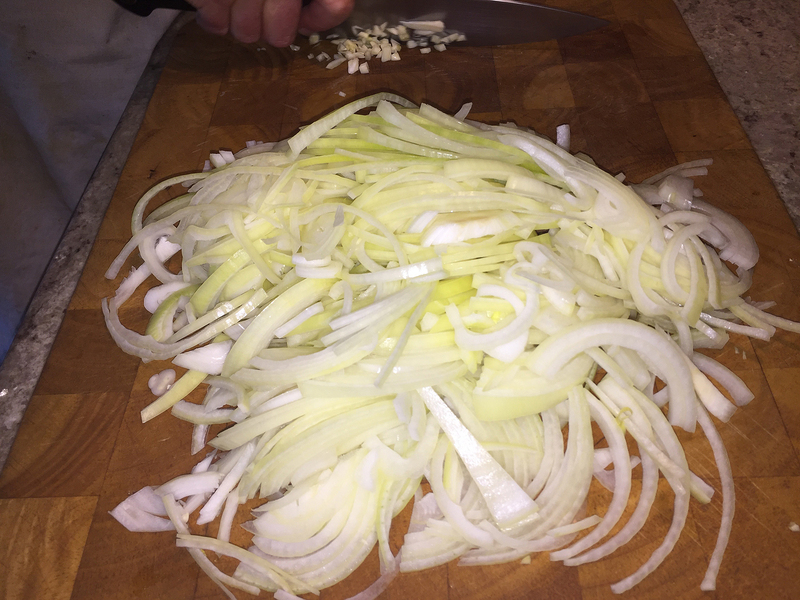 The onions are sliced while the garlic gets minced. Russ prepares the herbs and veggies. Before roasting, it is important to sear the roast on all sides to seal in the juices. 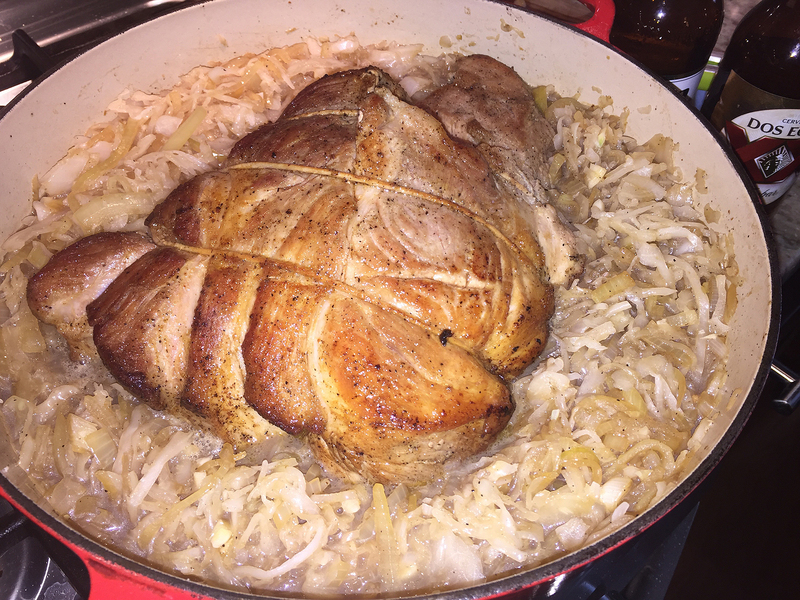 Here, the seared roast gets nestled into the sauerkraut and onions. After roasting for five hours, the pork is fall-apart fork tender. 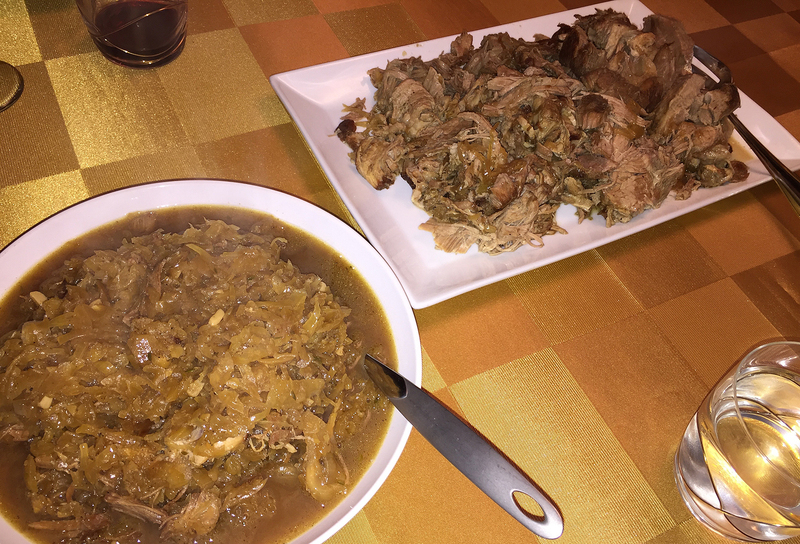 The sauerkraut and shredded pork shoulder are plated separately. 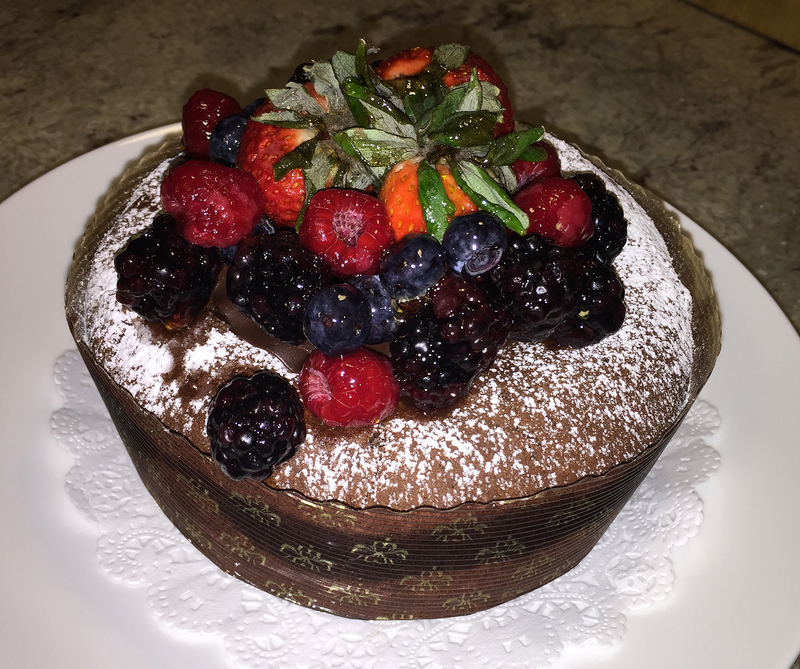 Dessert was Fran’s contribution and she thoughtfully addressed the fact that Russ was on a wheat-free diet by bringing an attractive flourless chocolate cake adorned with a variety of luscious berries. Not only was it picture-worthy, I understand it was very moist indeed! 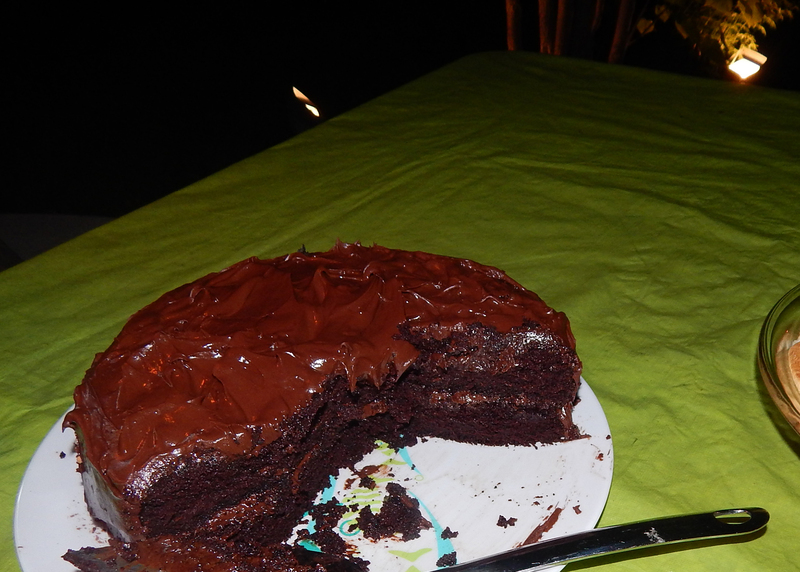 Flourless chocolate cake dessert before and after it is sliced. 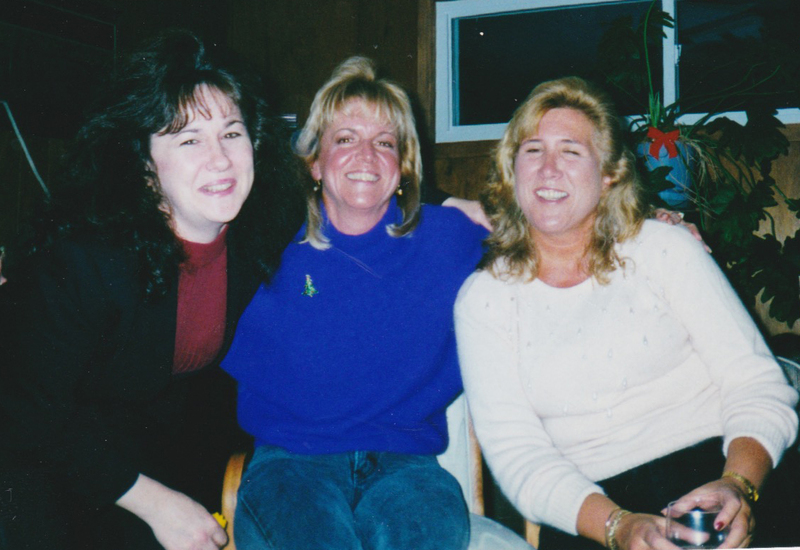 The three ladies obviously enjoying themselves, at B&B’s house in Yardley at Christmastime in the late 90’s. At least 8, or preferably 24 hours before cooking the pork, combine the first five ingredients and rub all of the pork. Wrap the meat tightly in plastic wrap, place on a plate and refrigerate. Remove meat from refrigerator and allow to warm at room temperature about an hour before you plan to cook it. Make a bouquet garni with the peppercorns and the juniper berries (if using them) and set aside. Be sure to double or triple the cheesecloth. Preheat the over to 290 degrees F. In a large Dutch oven with a tight fitting lid, heat 3 tablespoons of olive oil over a medium high flame until shimmering. Unwrap the pork shoulder and brown on all sides, about 15-20 minutes. Remove meat from pot and set on plate while you complete the next steps. Add the sliced onions to the pot and sauté until they be come transluscent. Add the chopped garlic and sauté for about one minute. Add the drained sauerkraut, then the 2 bottles of beer. Mix everything together well, making sure to deglaze the bottom of the pan. Add the bay leaves, thyme, sprig of rosemary and the bouquet garni. Mix well again with the sauerkraut and onions. 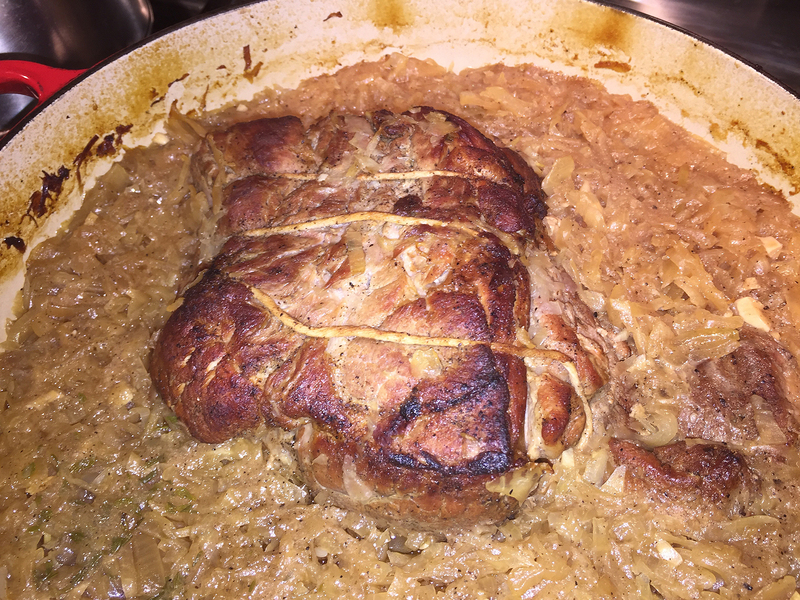 Return the pork shoulder to the pot, nestling it into the sauerkraut. Place a sheet of parchment or aluminum foil over the pot, then put on the lid ensuring that it fits tightly. Place the pot in the preheated over and cook for 2 1/2 hours. Turn the roast, then return it to the oven for another 2 to 2 1/2hours or until the meat is very tender and falls apart easily. 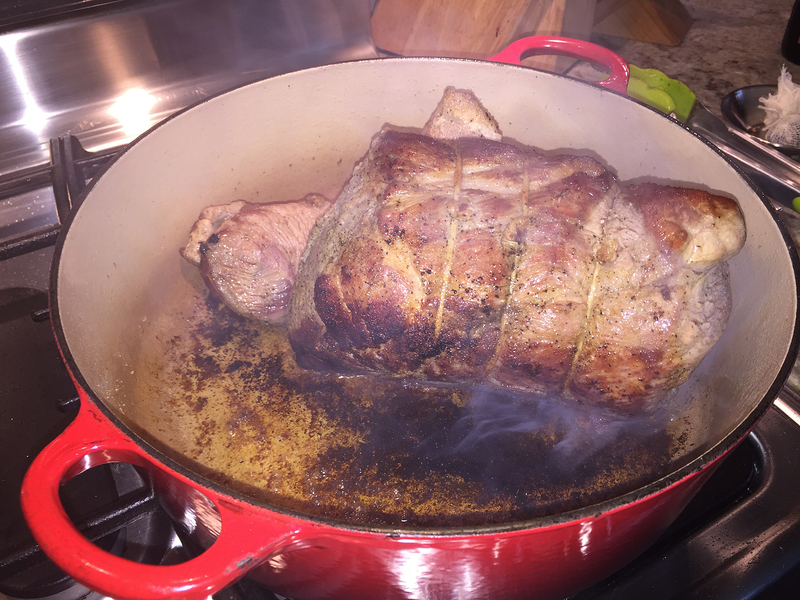 To serve, remove the pork shoulder from the pot to a platter to carve. Remove the bay leaves, rosemary sprig, thyme and bouquet garni and discard. 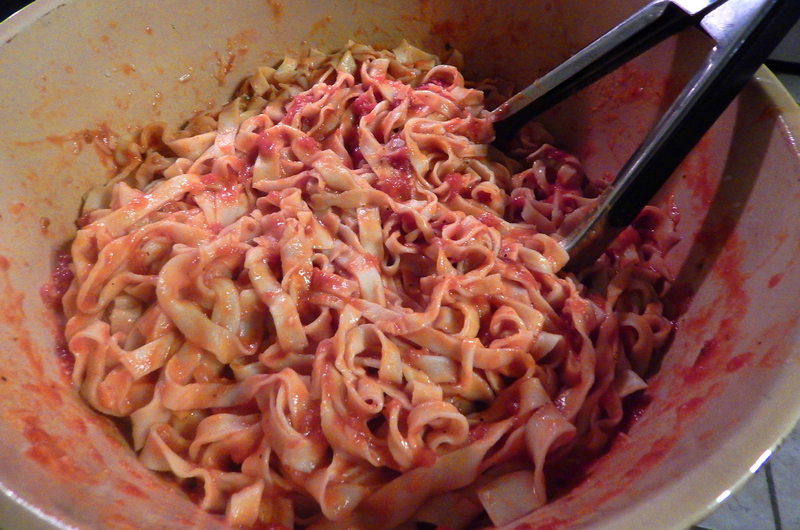 Give the sauerkraut mixture a good stir and serve with the pork. 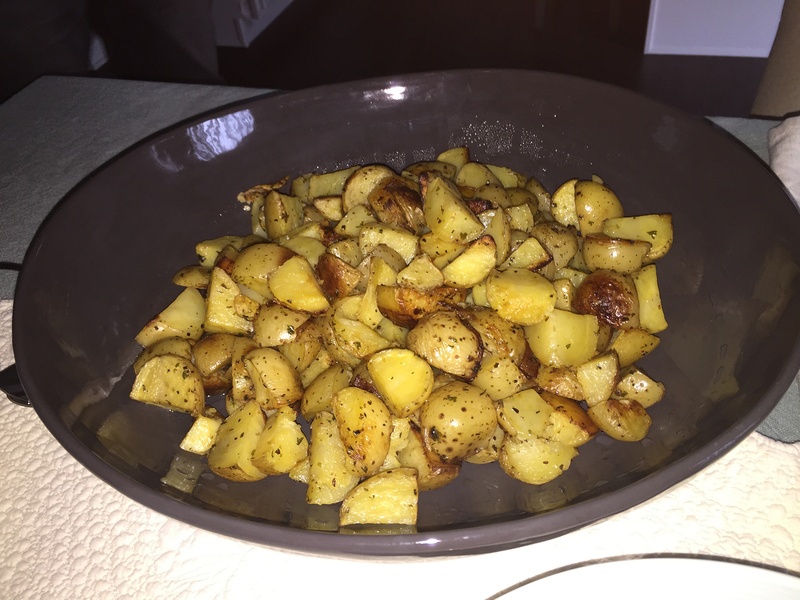 Serving Ideas: Serve with mashed potatoes or pureed celery root and potatoes. It’s traditional to serve apple sauce with this dish as well. Bring the milk, water, and 1 tablespoon salt to a boil in a large pot–keep an eye on the pot, because milk has a tendency to bubble up furiously. Drop in the celery root, potato, and onion, adjust the heat so that the liquid simmers steadily, and cook for about 30 minutes, or until the vegetables are tender and can be pierced easily with the point of a knife. Drain, discard the liquid, and shake the colander well to remove as much liquid as possible. In a food processor, in batches if necessary, puree the vegetables until perfectly smooth. Add the butter and whir until completely incorporated. Taste and add salt and white pepper as needed. Transfer the puree to a warm serving bowl and, if you’d like, top with a generous shower of chopped chives or a drizzle of pistachio oil or butter that’s been cooked over low heat until its color is honey brown. Serve immediately. 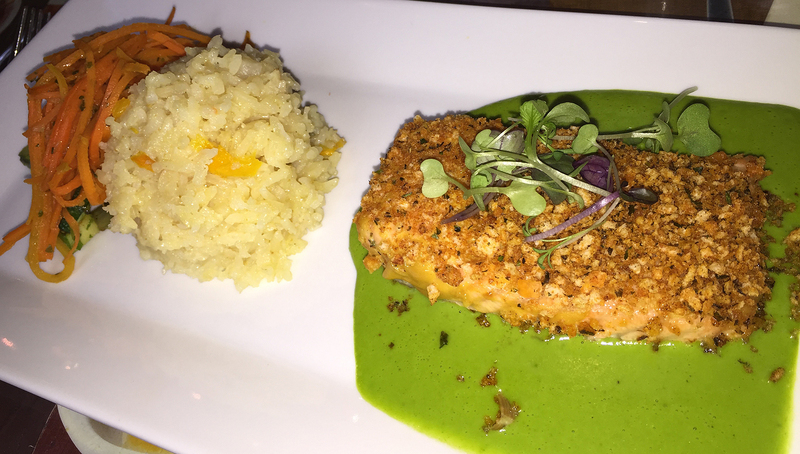 At Nectar, their love for cooking is deeply embedded in that belief. Located in Berwyn, it is a restaurant approaching legendary status for its huge menus, seasonal sushi mash-ups, and dedicated chef Patrick Feury—the man who refuses to let Asian fusion die. Nectar’s eclectically creative menu offers the perfect amalgamation of classic French cooking with the freshest, finest, seasonal and sustainable ingredients. From wild Alaskan salmon to Arctic Char to grass-fed beef to free range poultry to locally grown, hand picked organic produce; Nectar is committed to selecting what is best for their patrons as well as the planet. And so it was on a recent Saturday night that we met long-time friends Marie and Tommy Collinson for dinner at Nectar. 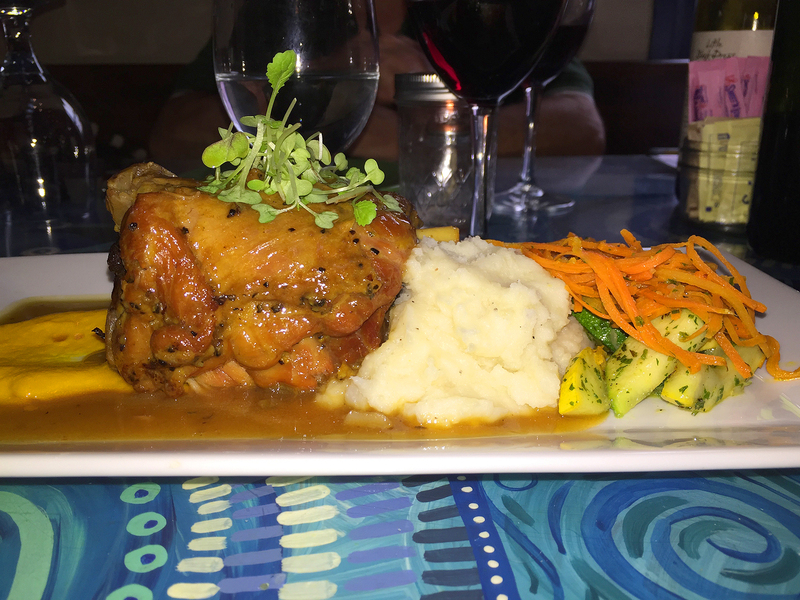 Ideally located between our two places of residence, I was intrigued to find out the Collinsons had previously dined there on numerous occasions; while Russ was there once for a luncheon, and it was my maiden voyage—but definitely not my last! 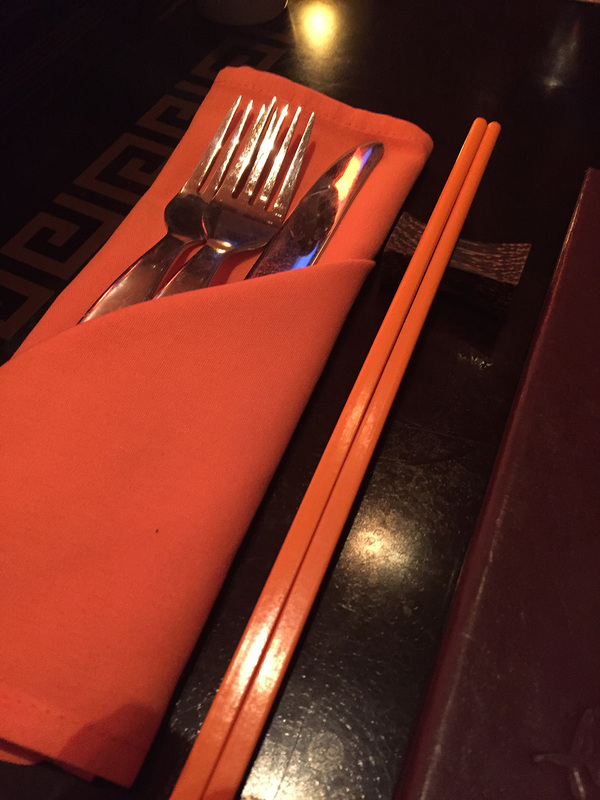 Immediately one is taken in by the clean lines of the Modern-Asian decor, with soaring ceilings and impressive light fixtures, many in orange, their signature color. We also noted the numerous candles parading up the brick wall, and found out that they are real candles that have to be lit and distinguished each evening—not a task I would want. Lynn’s “first” course of Edamame Dumplings. 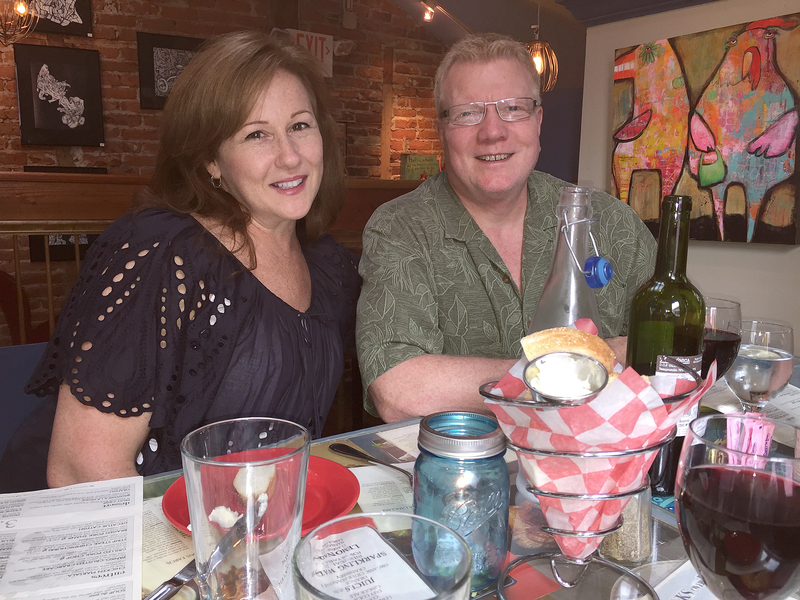 It was not an easy task to zero in on our choices, and in fact our knowledgeable waitress, Donna, had to come back several times before we finally made decisions. 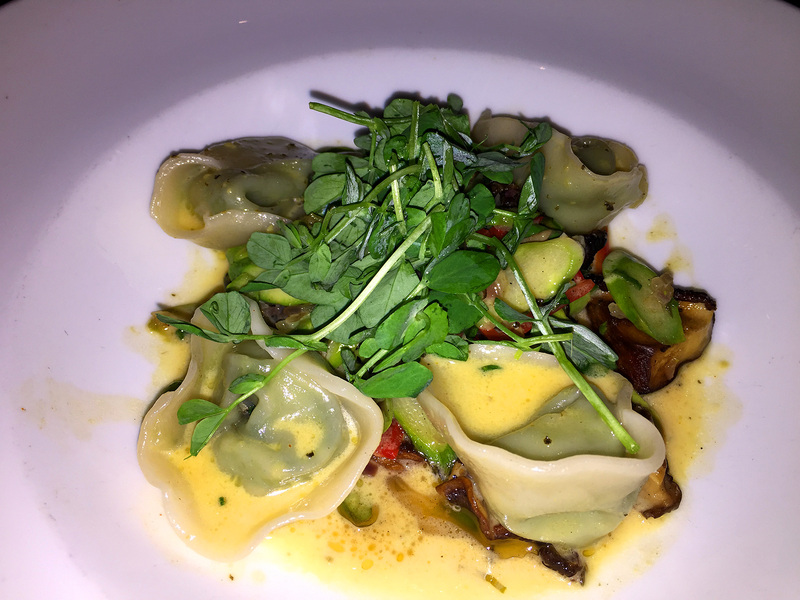 I initially was torn between the Chicken Curry or Steamed Pork Dumplings—both offering a spicy component—but Donna persuaded me to try the Edamame Dumplings with Chanterelle Mushrooms, Asparagus and Herb Sauce. WOW, I was in love! They were fantastic, even without a spicy note. A full shot and close-up of Russ’s appetizer, Yellowtail Two Ways. Tommy’s “first” choice was the Nectar Soy Wrap Roll. 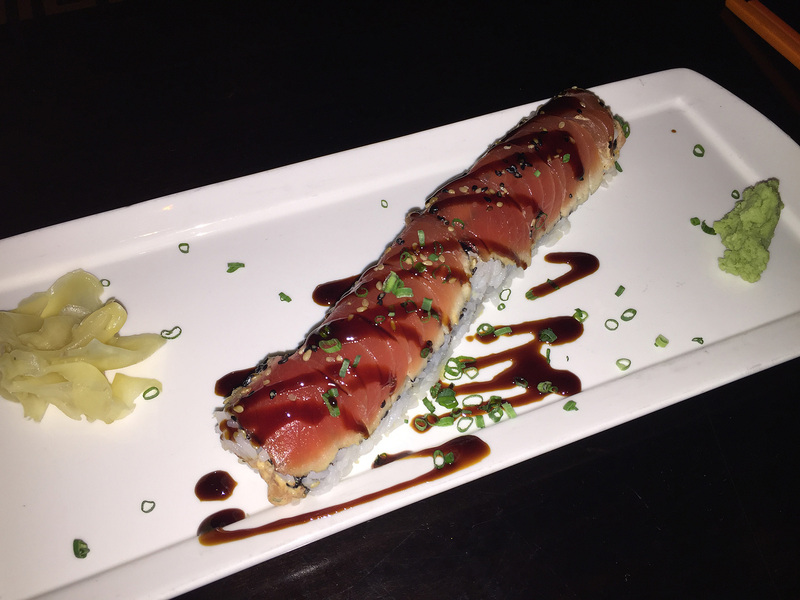 Look at Marie’s beautifully plated Seared Tuna Roll! 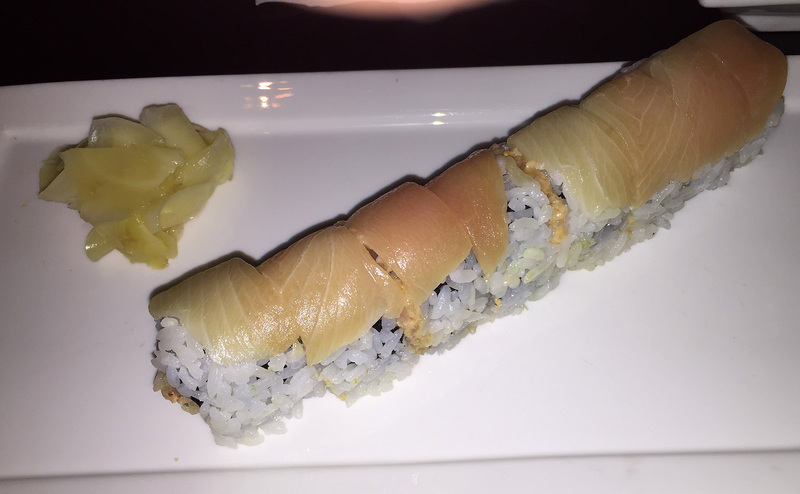 As “Firsts” for the other folks, Russ chose the Yellowtail Two Ways—outside yellowtail, inside spicy yellowtail. Marie’s choice was the Seared Tuna Roll—sesame crusted seared tuna outside, spicy salmon inside, with a crunch, and eel sauce. 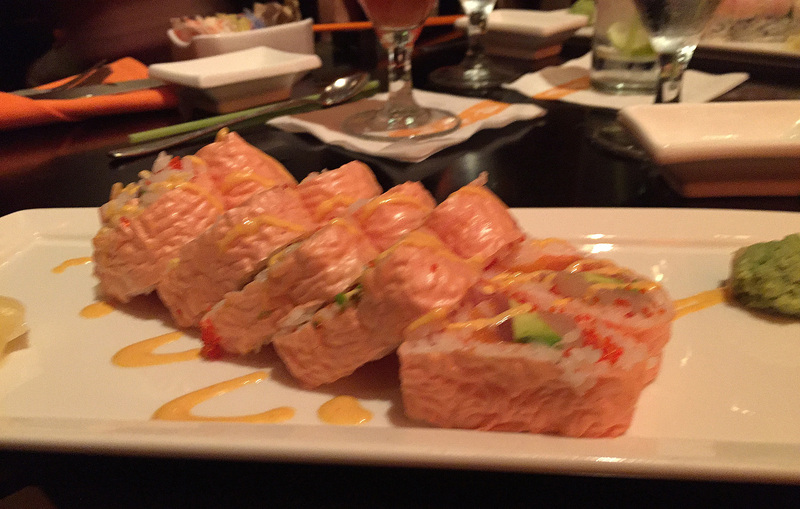 And Tommy got the Nectar Soy Wrap Roll—tuna, striped bass, salmon, avocado, and spicy mayo. There was lots of oohing an ahhing as we sampled everybody’s appetizers, not a single disappointment in the bunch. It certainly set the bar for the anticipated entrees. 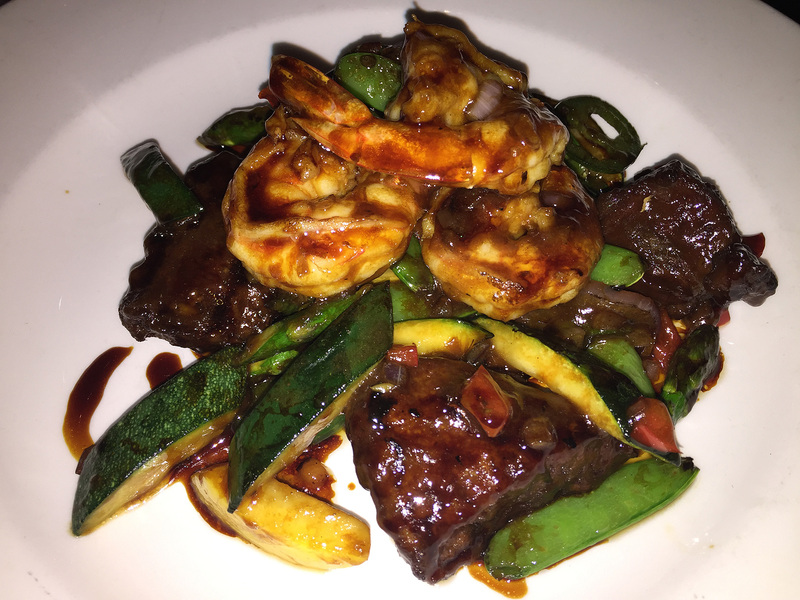 While there were so many options, it was a surprise when we realized Tommy and I both ordered the Sea Salt Crusted Shrimp and Beef Tenderloin with zucchini, asparagus and Windy Acres chilies; the beef was cooked to a medium-rare perfection that melted in the mouth. 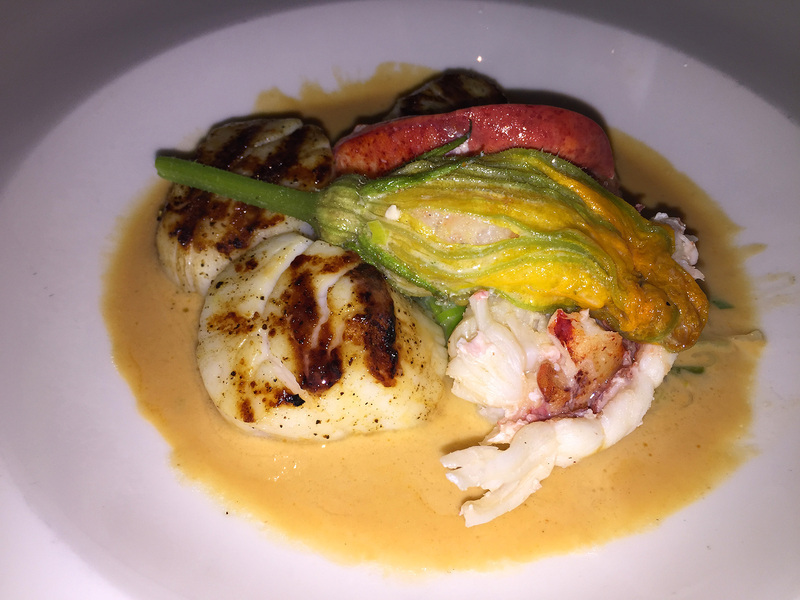 Marie and Russ similarly selected from the Specials Menu and chose the exquisite Poached Lobster with Viking Scallops with lobster-stuffed squash blossom, leek fondue, and nectar heirloom tomato lobster bisque—I think they both died and went to Heaven! I wanted to frame it, it was so gorgeous! Lynn and Tommy’s order of Sea Salt Crusted Shrimp and Beef Tenderloin. Marie and Russ both had the ???? We spent three pleasant hours laughing and catching up. Marie and I both toasted to the fact that we had been close friends for 4o years harking back to our single days in North Jersey, and yet there were periods of years that went by with out seeing each other. However, for the last five or so, we’ve been playing catch-up and making a commitment to regroup more often. 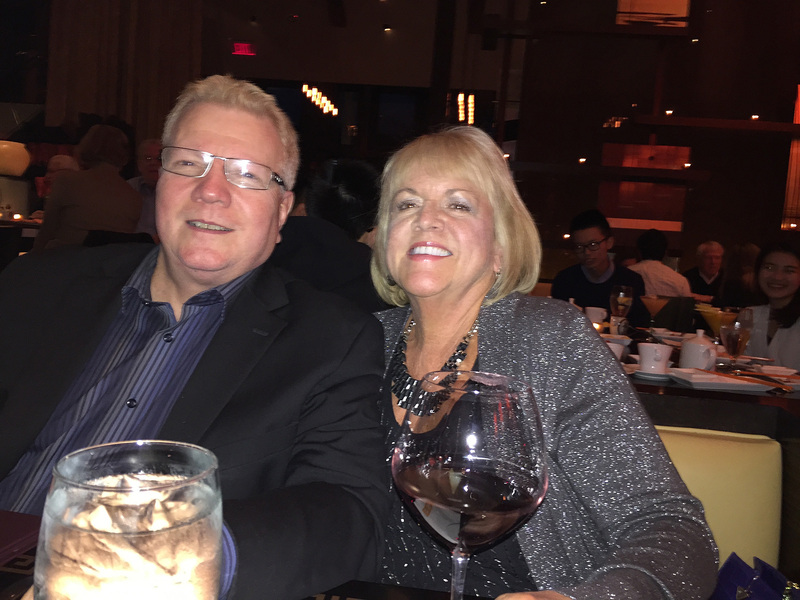 Marie and Tommy Collinson—never a dull moment with these two! With no room for dessert, we finished the evening over coffee and promises to get together again before too much time goes by. Let’s aim for another 40 Marie!! 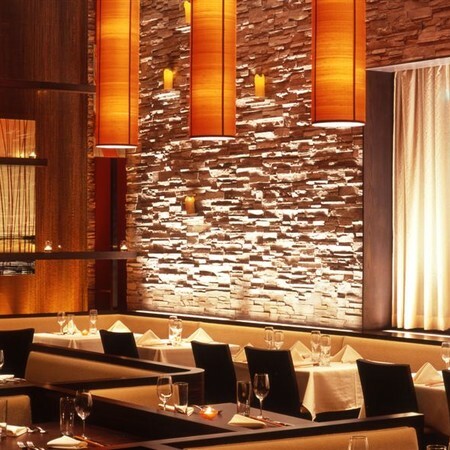 If you’re into a fabulous dining experience, you must put this restaurant on your bucket list! Every visit is special at Nectar, as you feel instantly sophisticated upon entering the high-drama interior designed by David Rockwell. Regulars rave about the Philly feel in the ‘burbs and award-winning menus—Trip Advisor’s top pick in PA; Best of Philly Mag’s Cheese Plate—plus specialty drinks to amp up the satisfaction level. Known for freshest, finest, seasonal and sustainable ingredients, Chef Patrick Feury turns out Asian fusion with a French twist. 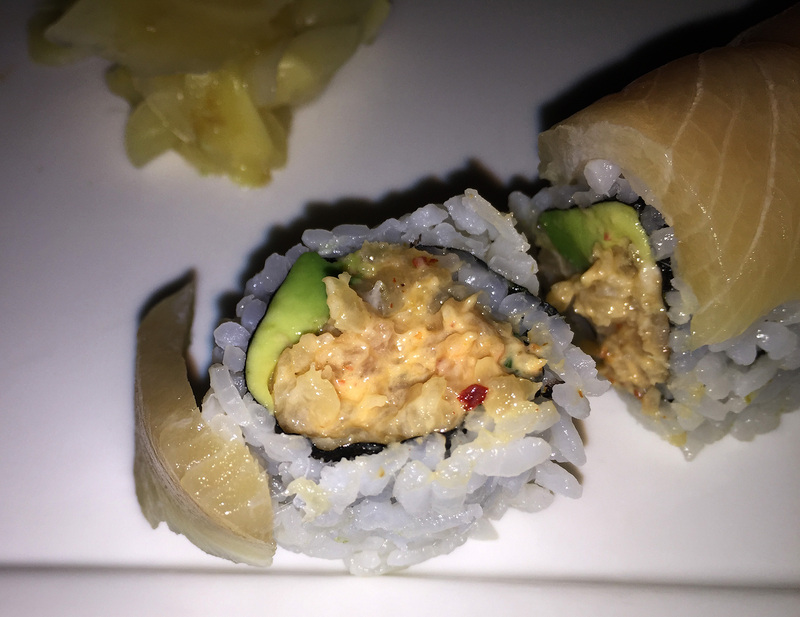 Sushi shines, as do most seafood dishes—love the lobster sliders and risotto options—plus the beloved mini-doughnuts with dipping sauces. Wine fans note Wine Spectator’s Award of Excellence and “Judgement Day” battle of PA and CA wines. Beer fans enjoy pairing dinners with Perennial Artisan Ales and Victory Beer. They do it all. Even though she left her position as graphic designer at the college almost two years ago—and only worked with me for three years—Edyta Kuciapa, affectionately known as E-Diddy, has continued to be a great friend and source of inspiration. Young enough to be my daughter, Edtya is an extremely talented artist and excels in whatever she puts her mind to. This particular evening she, and her sister Aneta, invited me and two other former coworkers, Rosanne Zarrilli and Wendy Humphrey, over for dinner at their new house in Florence, NJ. 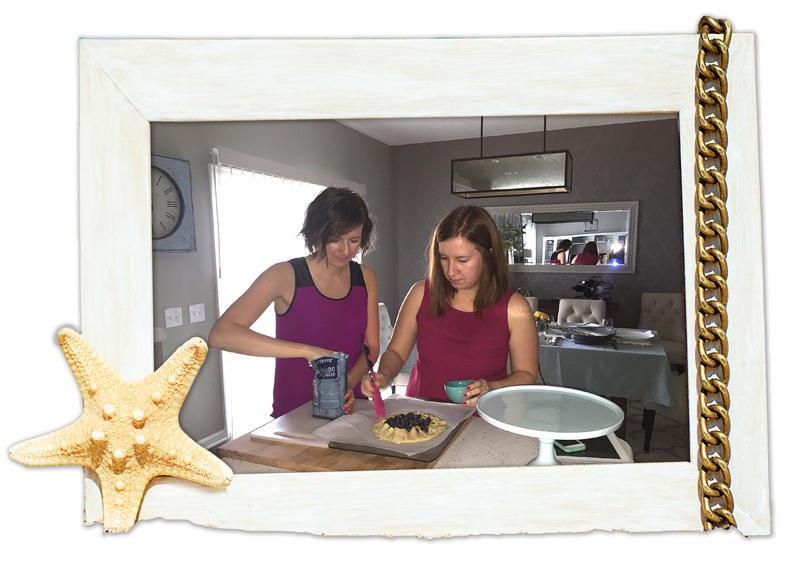 Sisters Aneta, left, and Edyta Kuciapa attending to the dessert. In the newly built two-story, the overall arching color palette utilizes gray—her favorite neutral—with accents of various blues and yellows. 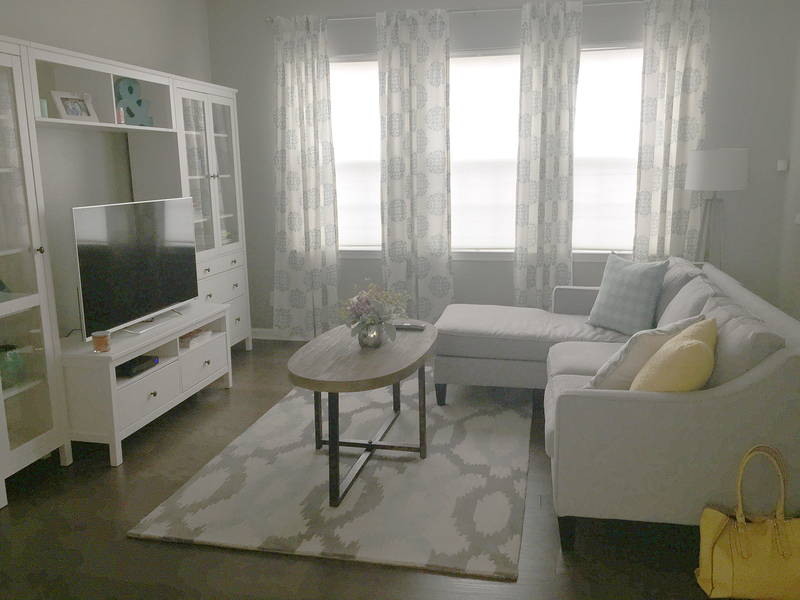 Without having seen the place beforehand, I just knew with her talent that the home decor was going to be HGTV-worthy (and you know what an HGTV junkie I am)—well we weren’t disappointed—absolutely a WOW factor when you walk in! The vibe is eclectic modern, traditional and slightly beachy, with a place for everything and everything in its place. 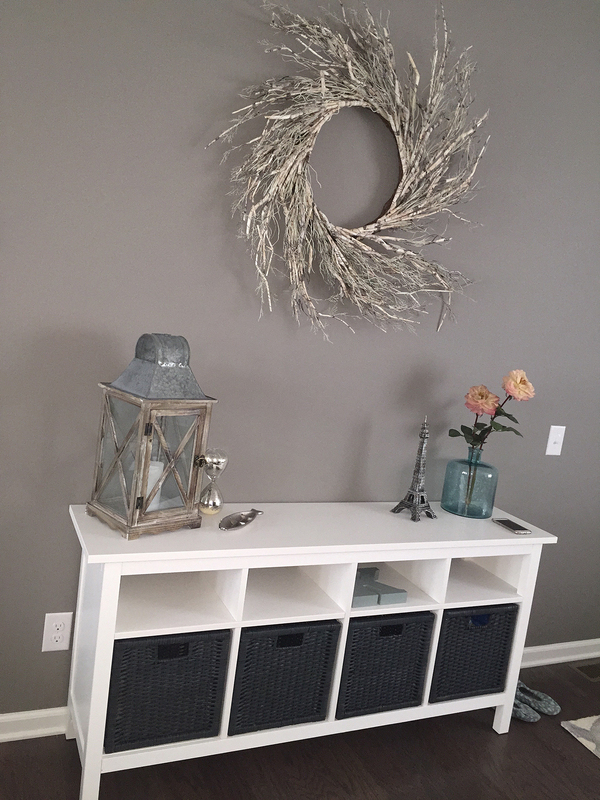 Favorite shopping haunts for the sisters are West Elm, Ikea, HomeGoods, TJ Maxx and Burlington Coat Factory, who surprisingly now have quite an array of home furnishings… sounds like a road trip to me! 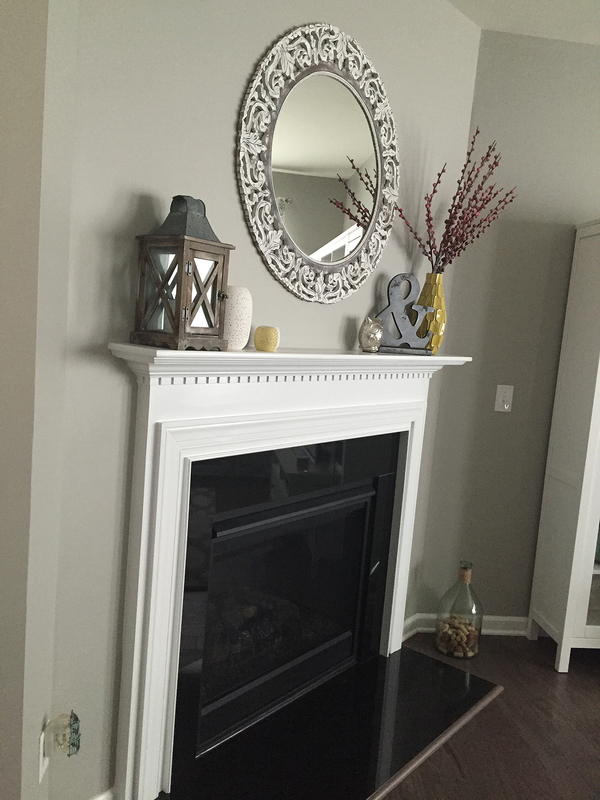 The following pictures show the first floor decor, although seeing the place in person is so much more impressive! 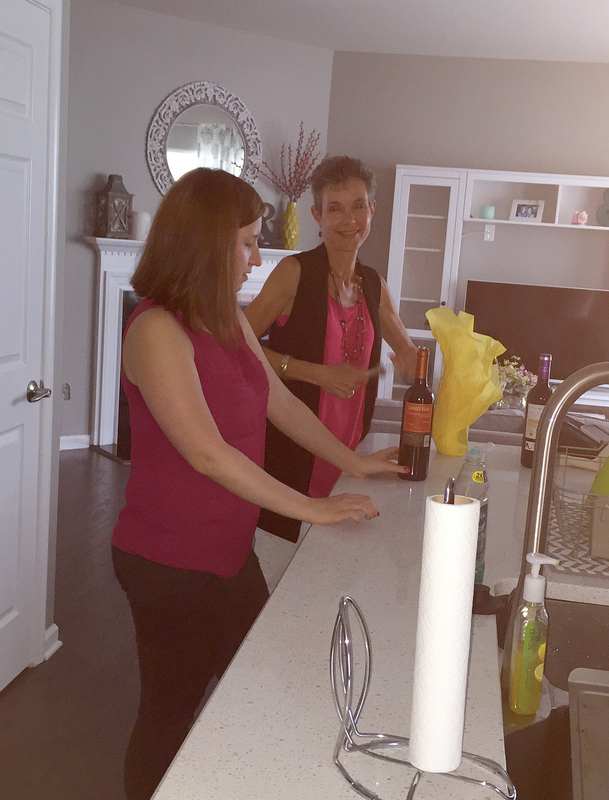 Edyta and Wendy discuss the merits of the hearty red Zinfandel—or are they discussing pants organization? On to the food part of the blog… The menu for the evening was Aneta’s scrumpcious Vegetable Lasagna, recipe courtesy of Ree Drummond, The Pioneer Woman of Food Network fame; Edtya’s fabulous Chicken Marsala; and sides of caprese salad, roasted potatoes, asparagus and roasted sweet peppers. Yum, yum and more yum! The three guests contributed bottles of red wine, some of which we enjoyed while dining over endless chatter and laughter. The vegetable lasagna in a round vessel. 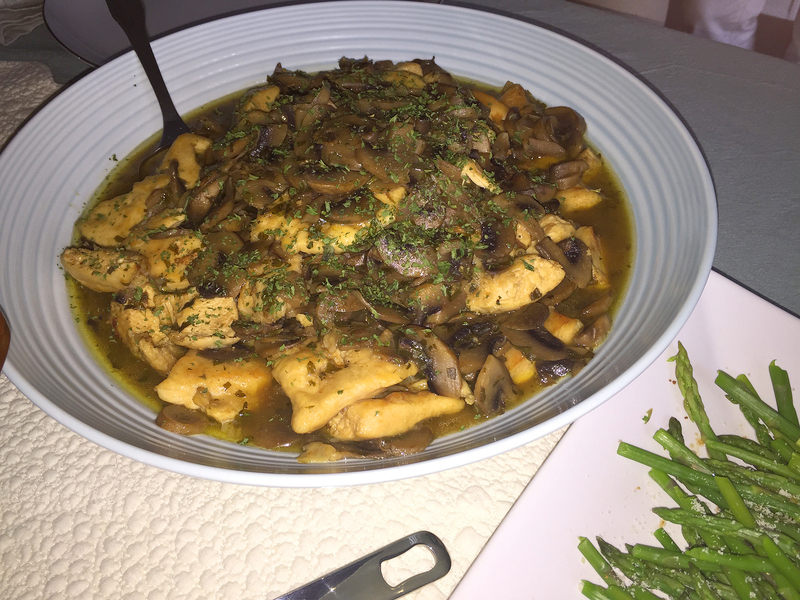 Chicken marsala with lots of tasty mushrooms. 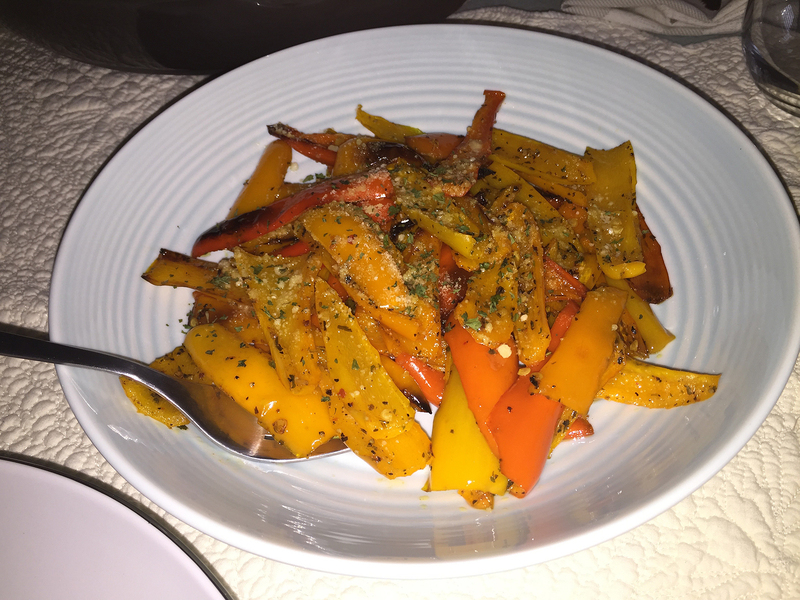 Side dishes of roasted potatoes and sweet peppers. 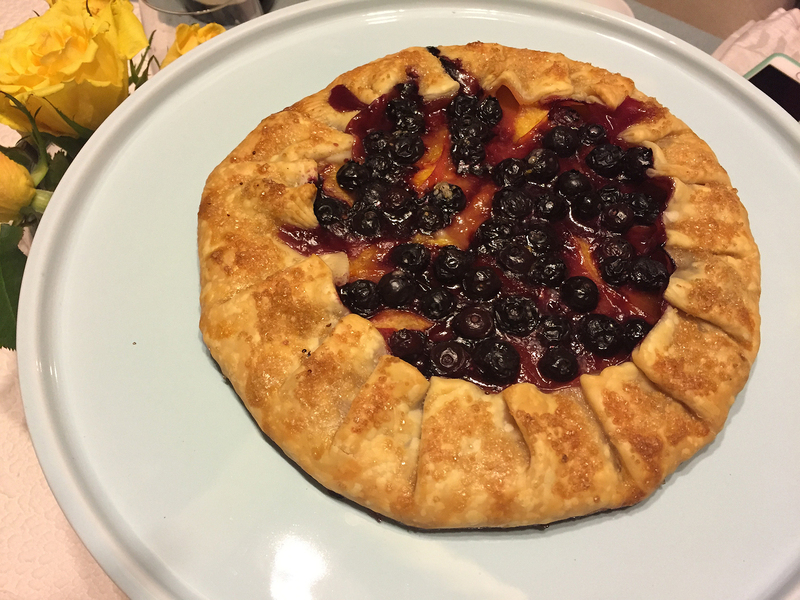 The “icing on the cake” was a homemade blueberry/peach Slab Pie, otherwise known as a crostada, served with a dollop of vanilla ice cream. From left, Lynn, Rosanne, E-Diddy and Wendy. So Edtya was E-Diddy long before Puff Daddy was called P-Diddy. 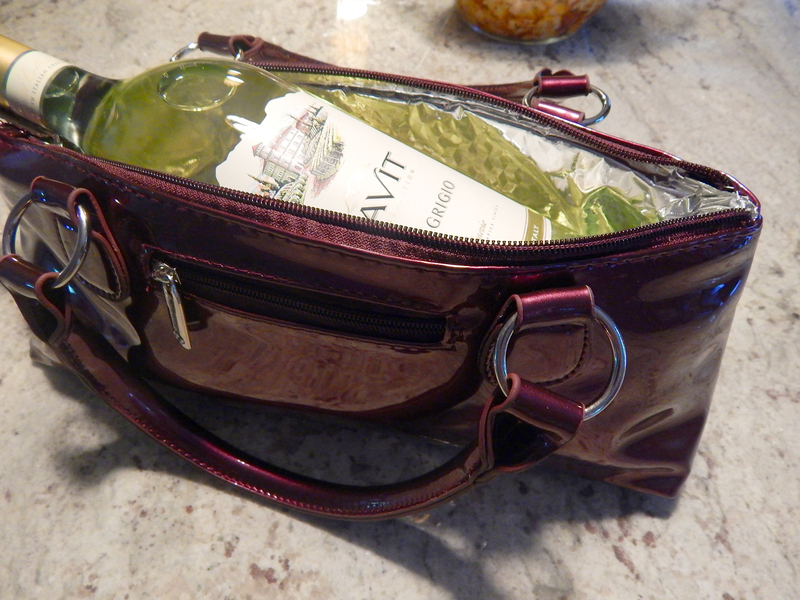 Another new, quirky BYO gets added to our list, yeah! 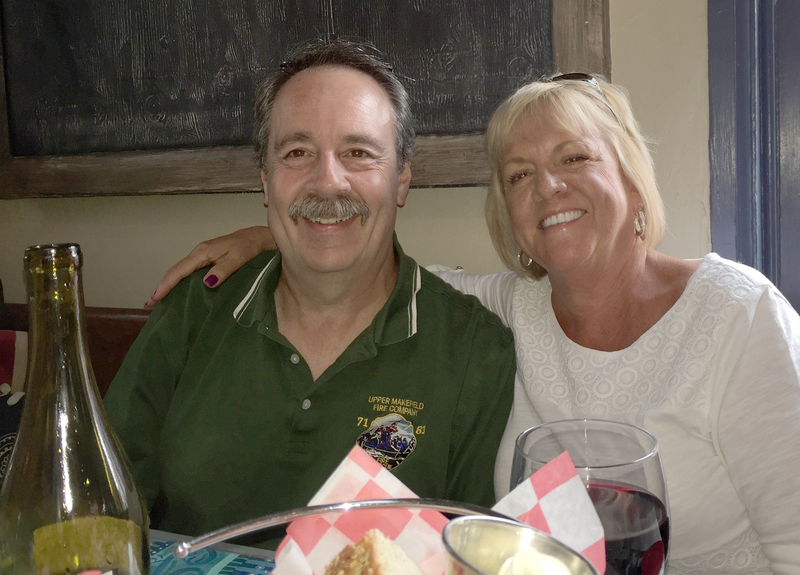 Ex-neighbors from our old ‘hood in Yardley, Fran and Grant McNinch now reside on Jericho Mountain just outside of New Hope in Bucks County, PA. We had the opportunity recently to visit them and dine at the Blue Moose Restaurant and Café, a BYO on Mechanic Street in New Hope. (Read the restaurant story below.) Apparently Fran has dined here on several occasions, likes the food and the atmosphere, and suggested we go one Sunday night. Always motivated by new places to feast, we eagerly signed onto the game plan. We endured just a short wait before we were led to our table on the second floor which is adorned in an artsy, industrial vibe. 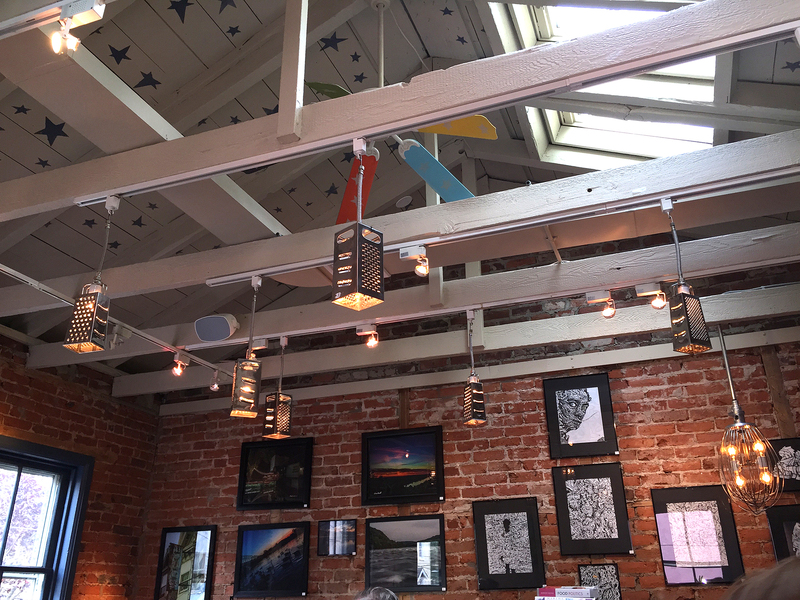 A large skylight, along with numerous “cheese grater” pendants illuminated the brick interior that was studded with original artworks of various sizes and mediums. The dinner menu, while short in nature, offers tempting choices with a fixed-price option for two or three courses; and a blackboard lists the daily specials. Ceiling view from the second story displaying “cheese grater” light fixtures. Instead of describing each person’s choices, you can see by the pictures below, who ordered what. Seems that Fran and Russ were on the same wave length with their entrées and dessert. In addition to the fact that each dish was so beautifully plated, the food itself was delicious and definitely worth another trip to New Hope. After the drive back to their house, and before we hopped in our own wheels, Fran ran into her house and emerged with a card and wrapped gift—my birthday was about a week and half away—how thoughtful of them to remember! BTW, Blue Moose offers a variety of Vegetarian, Vegan and Gluten-free options. Blue Moose Restaurant & Cafe was originally founded in 2006 by two Bucks County teens searching for something new to do on the weekends. Skylar Bird, then 14, and Pat Rodgers, then 15, launched forward into the exciting adventure of running the nation’s first 100% youth-run restaurant with absolutely no knowledge of how to run a restaurant. They began serving family and friends on a small scale basis out of Skylar’s converted mill home in Buckingham, PA. As word spread about what they were up to, area locals appeared to check out this unique dining experience, gaining the boys and their weekend supper club quite a following. Rodgers moved on from Blue Moose during its first year. At this juncture, Bird chose to expand his culinary experience in a decided effort to improve the cuisine at the Moose. Skylar began apprenticing part time at Just Eat by BrownGold, a unique European style bistro in the Buckingham Green shopping center. After some pleasurable time working there, while continuing to operate the Moose on the weekends, he took a four month hiatus and traveled to France. Here, Skylar set about knocking on the doors of several French restaurants until he finally found an internship in a thirty-seat restaurant in the city of Lyon. Upon returning home from France, Blue Moose’s menu was transformed into the European prix fixe style, which still remains for dinner at the restaurant today. 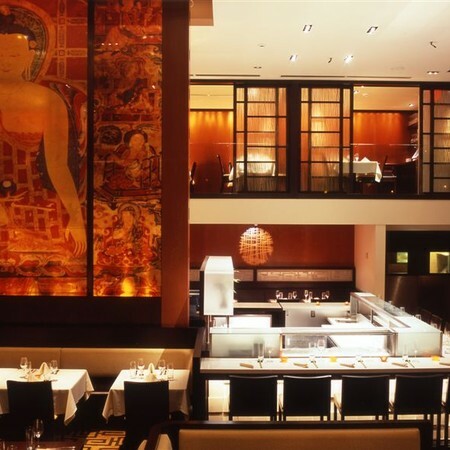 While continuing to operate Blue Moose on the weekends, Bird attended the French Culinary Institute in Manhattan in 2009, and worked in Manhattan at Floyd Cardoz’s Tabla before it closed at the end of 2010. What he likes best about cooking is that it combines art and science, and creates happiness! 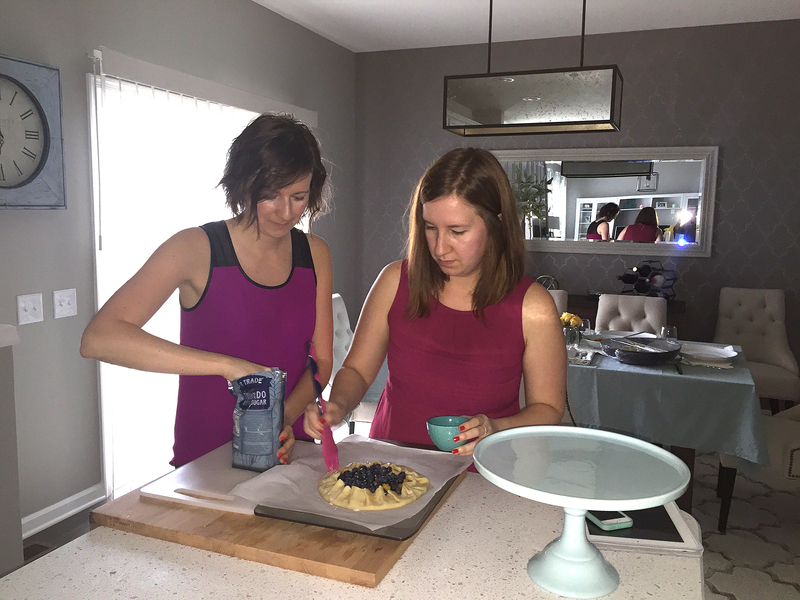 Since its creation, Blue Moose has worked with the youth of Bucks County, teaching them cooking technique and group dynamics in a work environment. Over four decades ago (really!? ), the five of us (not counting Russ) all met through the “cousin connection” in our Northern Jersey stomping grounds. You may recall that several of my female cousins and “friends of” enjoyed a night out in NYC back in March. Deciding to make sure it wouldn’t be years before we connected again, I promised to host a BBQ at my house in June. Unfortunately, for a variety of reasons, most of the actual cousins could not attend, but the “friends of” showed up eager to party! Who attended other than me and Russ? That would be the dynamic duo of Marie and Tommy Collinson, the ever-hysterical Margaret Millar, and Carolyn Evans with her infectious laugh. Marie and Tommy arrived first, and along with her yummy sundried tomato and cheese pasta salad and homemade chocolate cake, presented us with two very thoughtful gifts! One was a “very me” insulated purple purse wine tote containing a large bottle of Pinot Grigio and the other was a truly thoughtful Spanish cheese platter—which spoke to Russ immediately! Waiting for the two other women (husbands unable to join them), we were sipping beverages and noshing on Lynn’s Holy-Moley Great Guacamole (recipe blog posted 1/24/14), all while being entertained by Tommy’s laugh-a-minute antics and of the Collinson’s recent trip to Costa Rica. Immediately above: Carolyn Evans, Margaret Millar holding Tommy Collinson, Russ and Marie Collinson. After some time went by and a few phone calls were made, we heard a car door slam shut, so Russ went into the house to greet the arrivals at the front door. 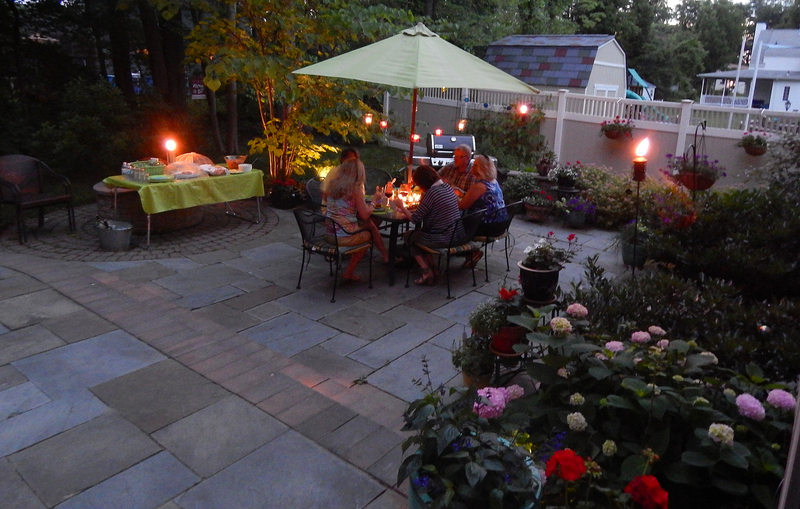 Unbeknownst to him, they came around the side yard directly to the patio bearing a plated layered guacamole dip (I neglected to inform Margaret I had already made guacamole) and a S’mores pie dessert compliments of Carolyn. After a few minutes it finally dawned on Russ that they must have circumvented the house, so he sheepishly rejoined the party. 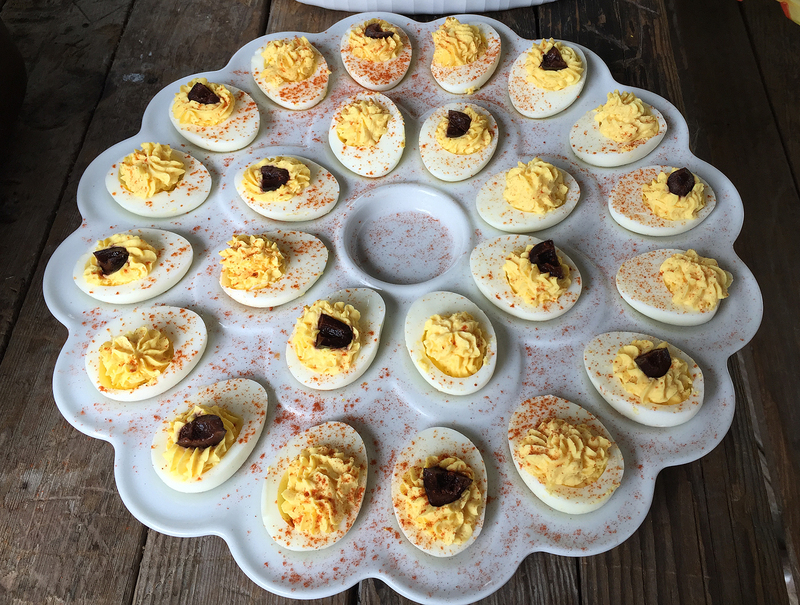 This was one menu that I wanted to be simple yet tasty without a lot of fuss, and with that in mind we grilled juicy burgers, served with sides of coleslaw, deviled eggs and Marie’s pasta salad. With darkness creeping in, we turned on the strings of light and lit tiki torches and citronella candles, all contributing to the festive atmosphere. Sundried tomato and cheese pasta salad. 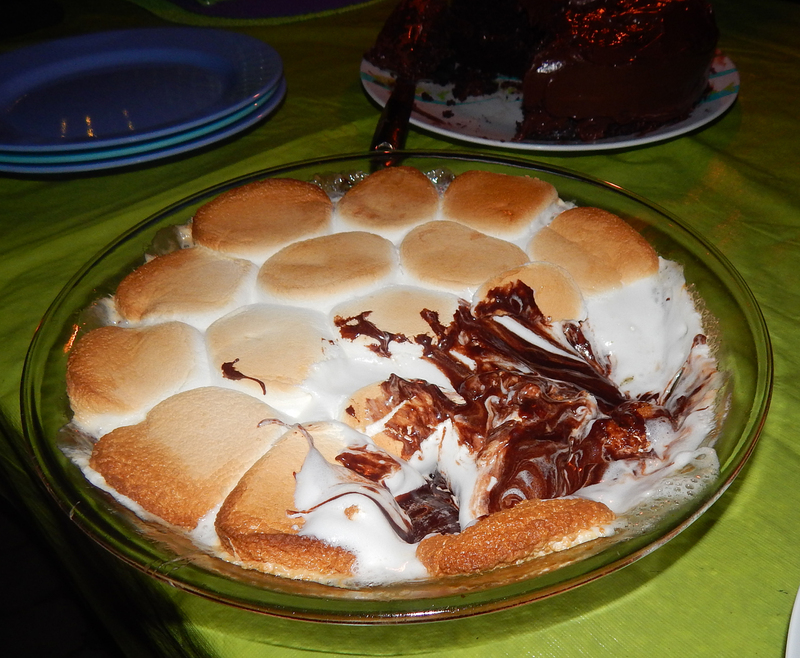 S’more’s pie compliments of Carolyn. Along with the pie and cake for dessert, guests were treated to Russ’ homemade strawberry ice cream. Then after cups of coffee, it was time to pack it in and drive home, with both cars heading in opposite directions—but not before making a date in September to connect again—this time at the Collinsons. 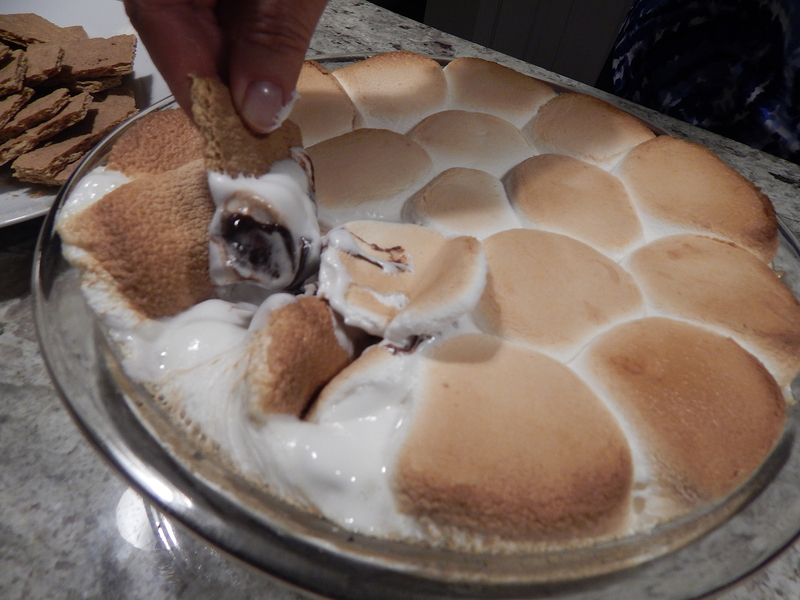 NOTE: I’m waiting to get the pasta salad and s’mores pie recipes from Marie and Carolyn, so when I do, I’ll add it to the blog. You have heard the old adage “Time Flies,” well it becomes increasingly prevalent as we get older. Which couldn’t have been more true in getting together with my cousin Tom and his wife Jacqui (who by the way, went from no grandchildren to three in 9 months time—CONGRATS!) Last we met was about 1 1/2 years ago, and the Saturday we had invited them over for dinner almost didn’t happen. Jacqui called early that morning to say their furnace had stopped working (with frigid Siberian Express temps outside) and she wasn’t sure when the repairman would get to their house. Then, by early afternoon a Winter Storm Warning had been posted with up to six inches predicted, turning to icy rain later that night. 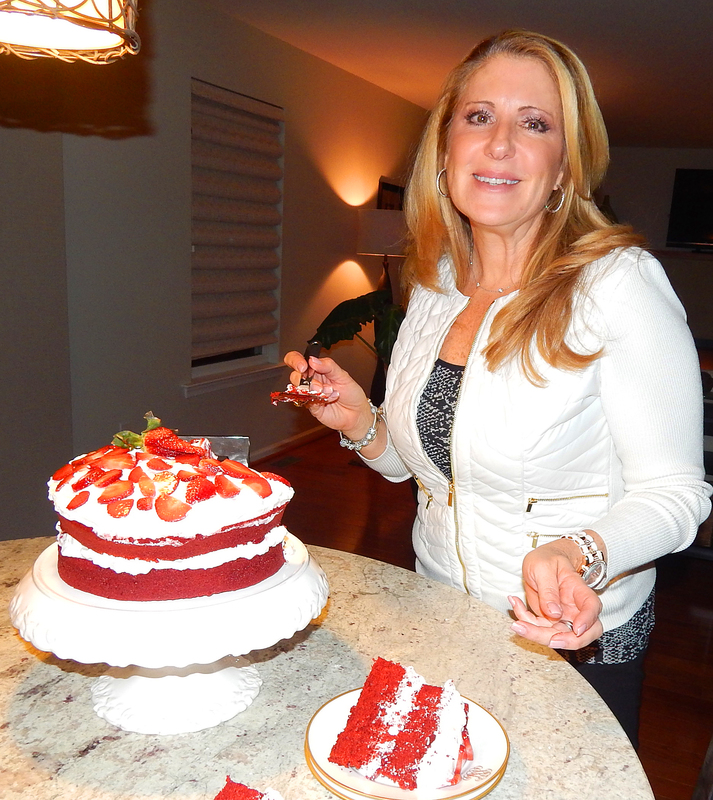 Jacqui slicing into her homemade Red Velvet Cake. 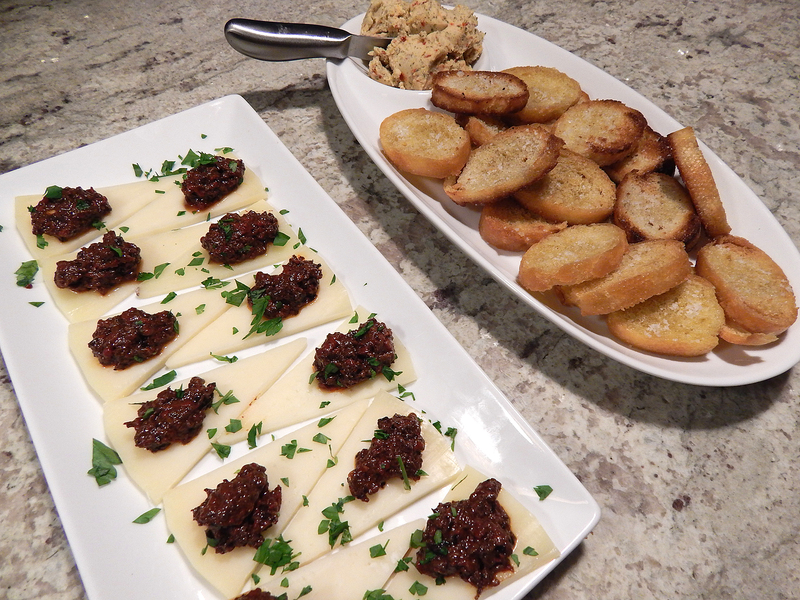 Appetizers of manchego cheese triangles with olive tapenade and sautéed baguette rounds with a hot and spicy Abbruzze cheese spread. 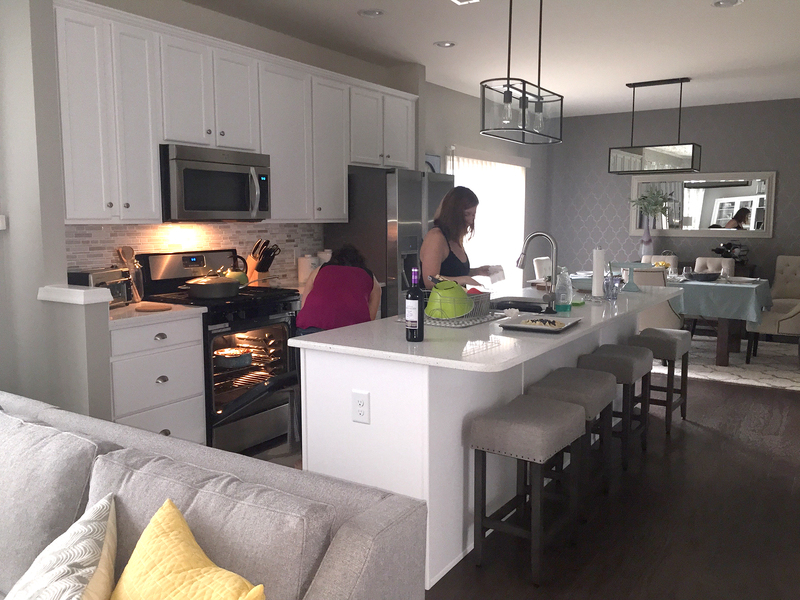 So when Jacqui called later that afternoon, it seemed inevitable that we would have to reschedule, but she happily replied that they had heat, her dessert was made, and they planned on leaving by 5 p.m. But 75 minutes later, with the storm intensifying and they still hadn’t arrived, I began to worry. Luckily they pulled into our driveway shortly thereafter, and Tom explained none of the roads had been plowed, not even I-95! For once this season the weather folks actually underestimated. 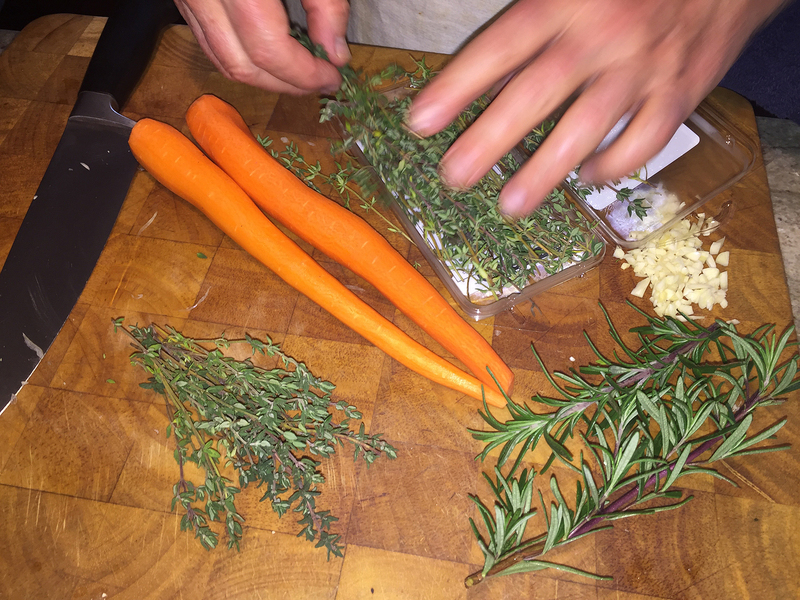 The following photos depict the steps to make the herbed goat cheese rounds. The night started with catching up on all that had transpired in the preceding 18 months while noshing a few simple appetizers and sipping Valentini cocktails (recipe shared on Valentine dinner blog.) 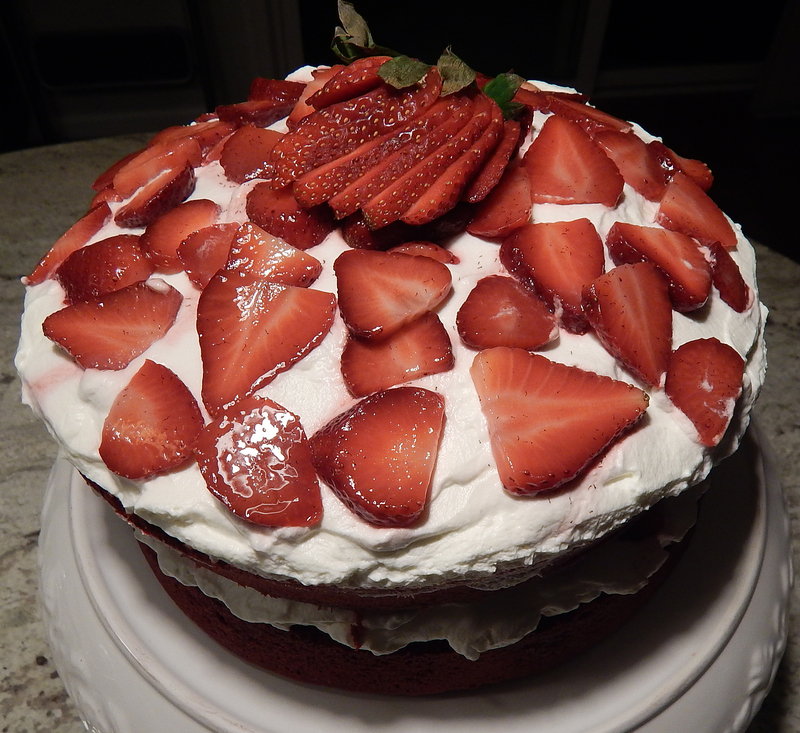 Conversation flowed through dinner, into dessert—a fabulous Red Velvet Cake with whipped cream frosting topped with sliced fresh strawberries—Jacqui outdid herself again, as she is a fabulous cook in her own right with a gourmet chef’s kitchen to die for! Before we knew it, it was 1:15 a.m., and they had to drive home yet. By now an icy rain was coming down, making for a not-so-pleasant trip back. Luckily they encountered no issues. We all hope that much time doesn’t pass between us again, but in the meantime, there’s always social media, blogs, texts, and phone calls… but nothing like actually getting together… how time flies! Trimming the lamb shanks: If the shanks are covered in a tough parchment-like outer layer (called the fell), trim this away by inserting a thin knife under it to loosen and peeling back this layer. Remove any excess fat as well, but don’t fuss with trying to peel off any of the thin membrane—this holds the shank together and will melt down during braising. Dredging the lamb shanks: Pour the flour into a shallow dish and stir in 1 tablespoon of the paprika. Season the shanks all over with salt and pepper. Roll half the shanks in the flour, lifting them out one by one and patting to remove any excess, and set them on a large plate or tray, without touching. Browning the lamb shanks: Heat the oil in a large heavy-based braising pot (6- to 7- quart) over medium heat until it shimmers. Add the 3 flour-dredged shanks (you’re searing in two batches so as not to crowd the pot). Cook, turning the shanks with tongs, until they are gently browned on all sides, about 10 minutes total. 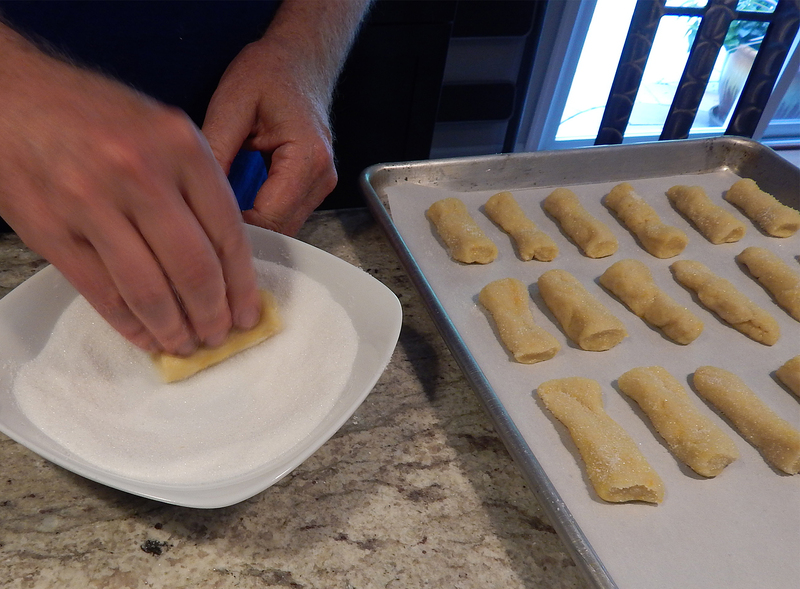 Transfer the shanks to a plate or tray, without stacking or crowding. 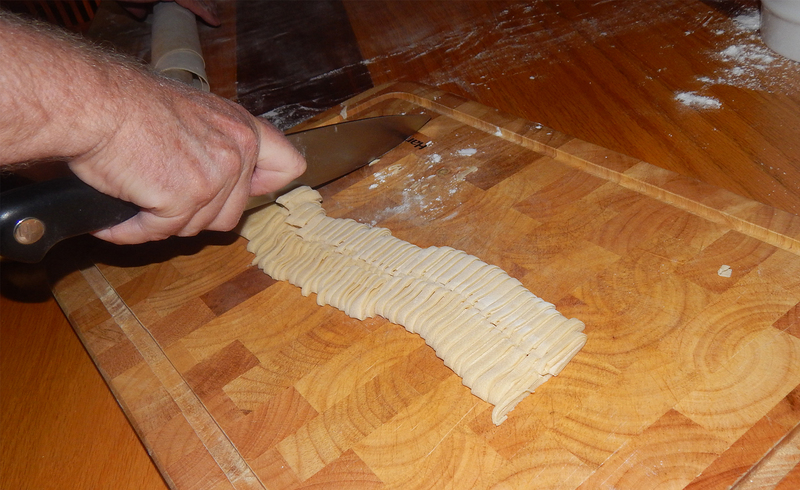 Dredge the remaining shanks in flour, patting to remove any excess, and brown them. Set beside the already browned shanks, and discard the remaining flour. The aromatics and braising liquid: Pour off all but 1 tablespoon of fat from the pot and return the pot to the heat. If the bottom of the pot is at all blackened, wipe it out with a damp paper towel, being careful to leave behind any tasty caramelized drippings. Add the onions, tomatoes with their juice, and the garlic and season with the remaining ½ teaspoon paprika and salt and pepper to taste. Sauté over medium heat, stirring occasionally, for 8 to 10 minutes, or until the onions are mostly tender. Pour in the wine and stir and scrape with a wooden spoon to dislodge any browned bits on the bottom of the pot that will contribute flavor to the liquid. Simmer for 3 minutes. Pour in the stock, stir and scrape the bottom again, and simmer for another 3 minutes. Meanwhile, zest the lemon: Using a vegetable peeler, remove the zest from half of 1 lemon, being careful to remove only the outermost yellow zest, not the bitter-tasting white pith; reserve the lemon. Add the zest to the pot, along with the bay leaves. The braise: Arrange the lamb shanks on top of the vegetables. The shanks should fit fairly snugly in the pot, but you may need to arrange them “head-to-toe” so they fit more evenly. Don’t worry if they are stacked in two layers. Cover the pot with parchment paper, pressing down so that it nearly touches the lamb and the edges of the paper extend about an inch over the side of the pot. 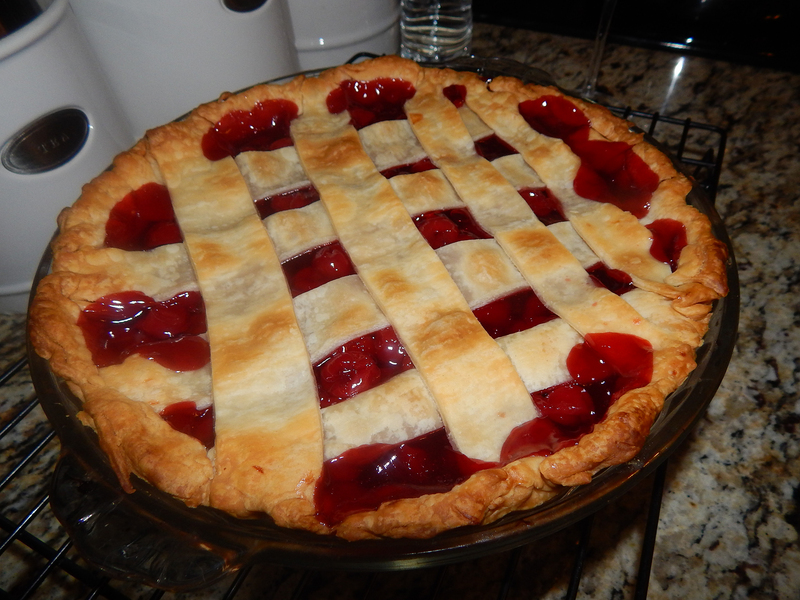 Set the lid in place, slide the pot into the lower part of the oven, and braise for about 2½hours. Check the shanks every 35 to 45 minutes, turning them with tongs and moving those on top to the bottom and vice versa, and making sure that there is still plenty of braising liquid. If the liquid seems to be simmering too aggressively at any point, lower the oven heat by 10 to 15 degrees. If the liquid threatens to dry out, add ⅓cup water. The shanks are done when the meat is entirely tender and they slide off a meat fork when you try to spear them. Segmenting the lemon: While the shanks braise, use a thin-bladed knife (a boning knife works well) to carve the entire peel from the 2 lemons. The easiest way to do this is to first cut off the stem and blossom end of each one so the lemon is flat on the top and bottom. Then stand the lemon up and carve off the peel and white pith beneath it with arcing slices to expose the fruit. Trim away any bits of pith or membrane that you’ve left behind, until you have a whole naked lemon. Now, working over a small bowl to collect the juices, hold a lemon in one hand and cut out the individual segments, leaving as much of the membrane behind as you can. Drop the segments into the bowl, and pick out the seeds as you go. When you finish, you should be holding a random star-shaped membrane with very little fruit pulp attached. Give this a squeeze into the bowl and discard. Repeat with the second lemon. 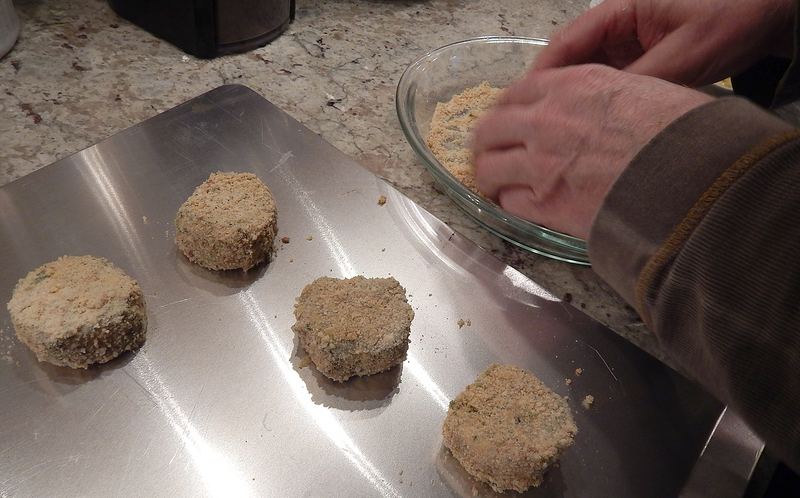 The finish: Transfer the shanks to a tray to catch any juices, and cover with foil to keep warm. Using a wide spoon, skim as much surface fat from the cooking liquid as possible. Lamb shanks tend to throw off quite a bit of fat: continue skimming (tilting the pot to gather all the liquid in one corner makes it easier) until you are satisfied. Set the pot over medium heat and bring to a simmer. 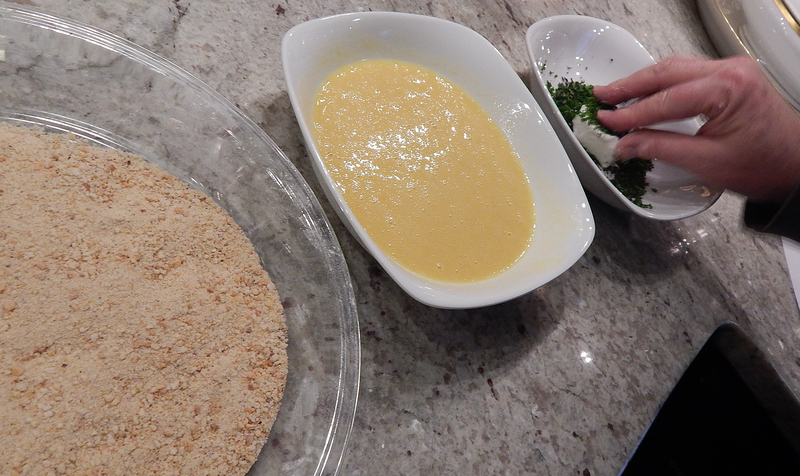 Stir in the lemon segments, olives, and parsley. Taste for salt and pepper. Return the shanks to the braising liquid to reheat for a minute or two. 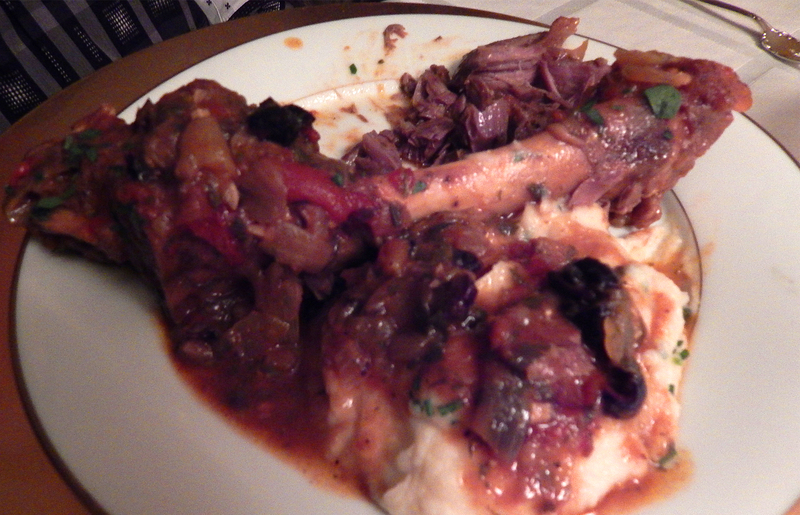 Serve with plenty of sauce spooned over each shank. For the best warm goat cheese salad recipe, Melba toast crumbs give the cheese an exceptionally crisp crust. 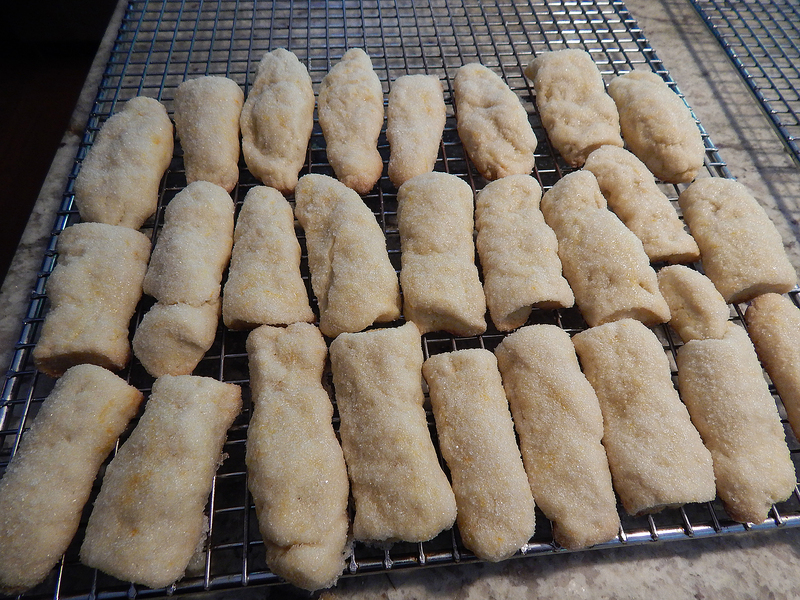 Freezing the breaded goat cheese rounds for 30 minutes before baking them in a hot oven ensured a crunchy coating and a smooth, but not melted, interior. 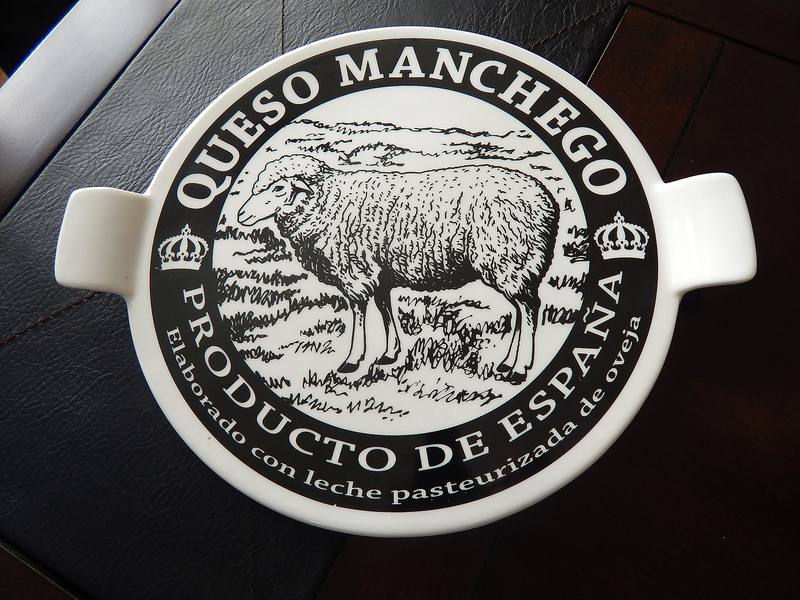 For Goat Cheese: In food processor, process Melba toasts to fine even crumbs, about 1 1/2 minutes; transfer crumbs to medium bowl and stir in pepper. Whisk eggs and mustard in medium bowl until combined. Combine thyme and chives in small bowl. For Salad: While goat cheese is baking, combine vinegar, mustard, shallot, and salt in small bowl. Whisking constantly, drizzle in olive oil; season to taste with pepper. Place greens in large bowl, drizzle vinaigrette over, and toss to coat. 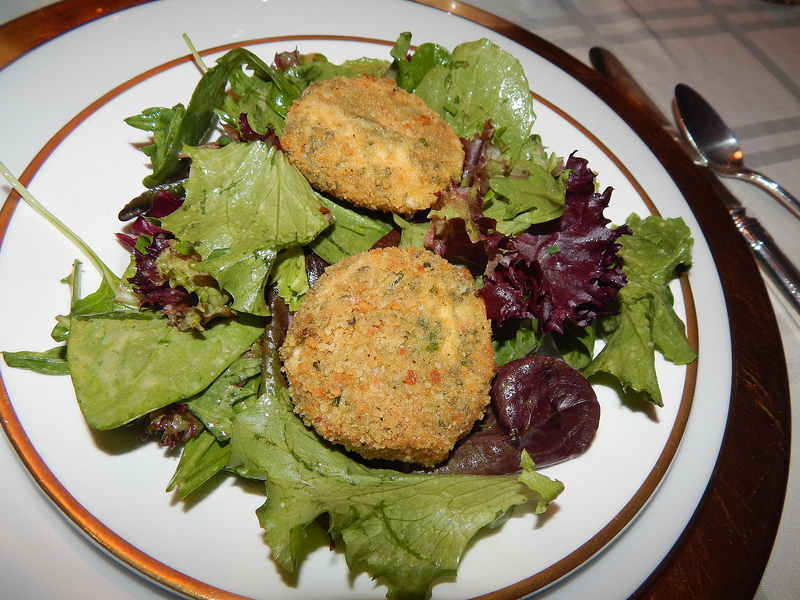 Divide greens among individual plates; place 2 rounds goat cheese on each salad. Serve immediately. 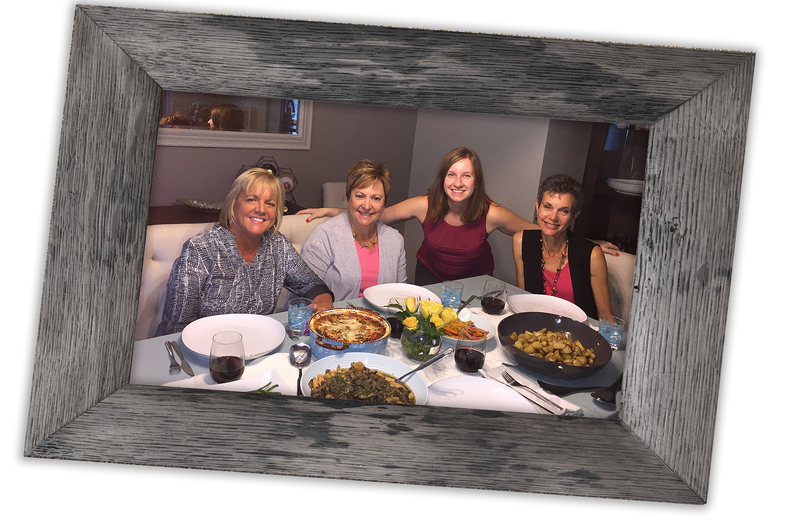 Having spent eight days in Italy with Paula and Mike Graham last April, we promised we’d all get together back at home to “relive” our experience before too many months went by. 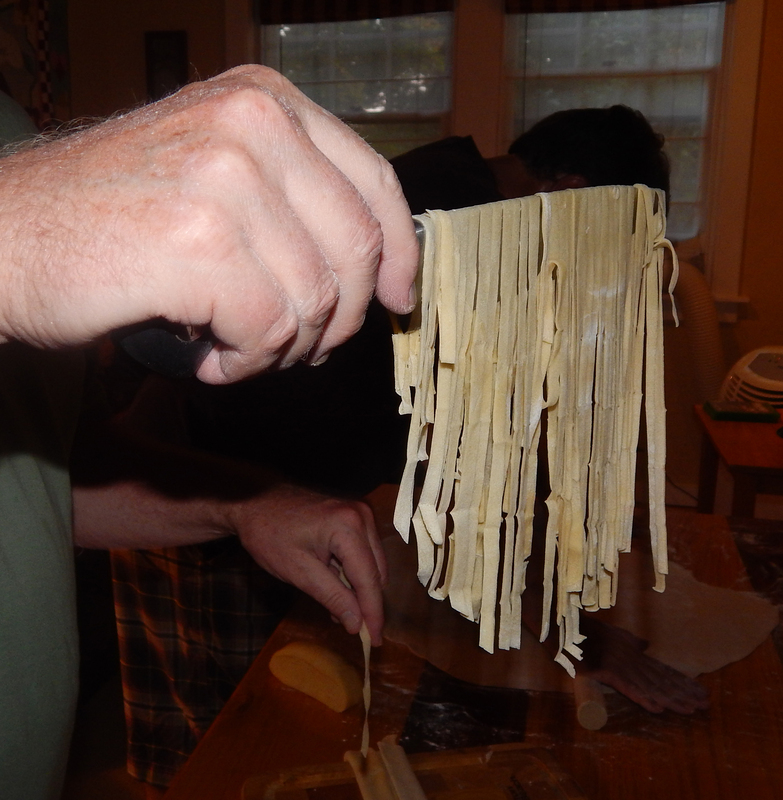 Along that vein, we planned to make homemade pasta (as we did with Massimo in Tuscany—see post on April 23, 2014), cook the Tuscan bean soup picked up in Montepulciano, savor some Vin Santo so carefully transported back from Avignonese to Philadelphia, exchange photos and reminisce. After a few aborted attempts to connect, Russ and I traveled to the Grahams house in Oreland, PA in late July. Paula assembled the most gorgeous antipasto platter complete with various cheeses, nuts, olives, meats, crackers and spreads. 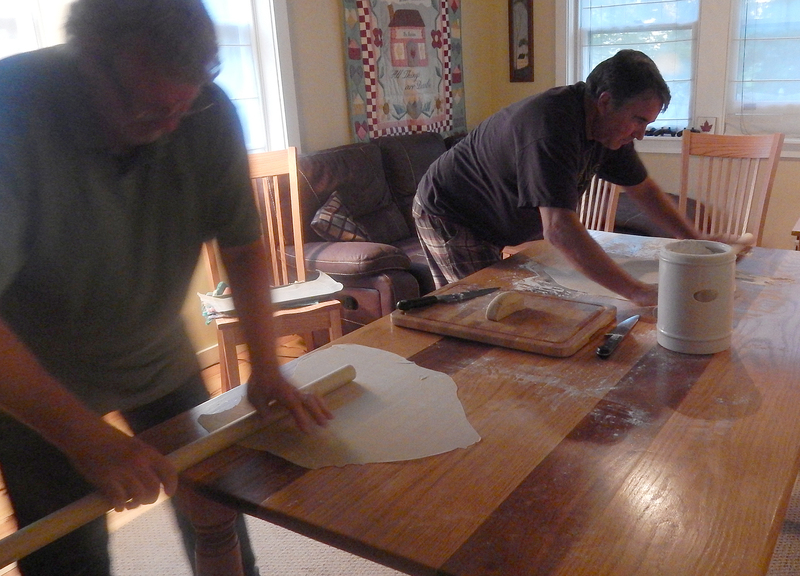 And while the Tuscan bean soup simmered away on the stove, we all enjoyed “un bicchiere di vino rosso.” Then the guys got right to rolling out the fresh pasta dough (made hours earlier by Lynn and Russ) using Mike’s homemade “dowel” rolling pins. 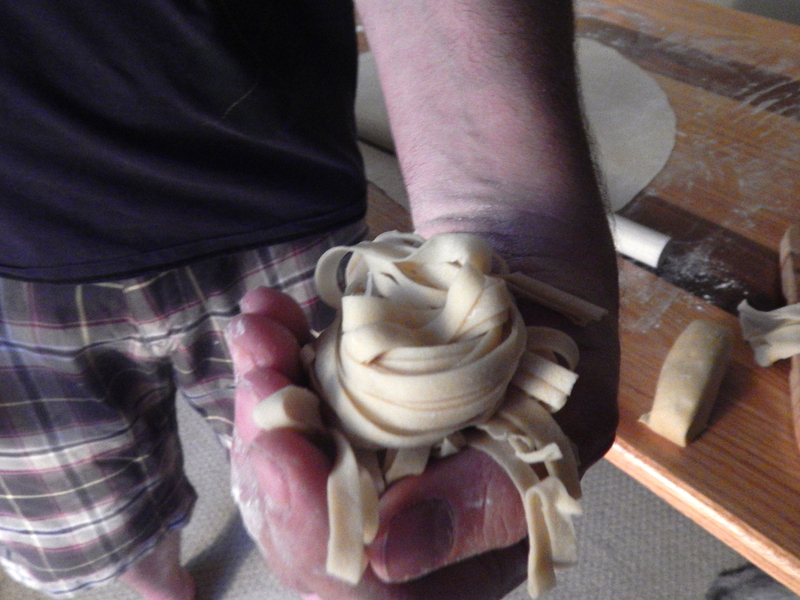 While our collective techniques were not perfect, we impressed ourselves on how well the tagliatelle actually turned out! In your mix master with the paddle attachment, mix ingredients at speed 2 for 30 seconds. 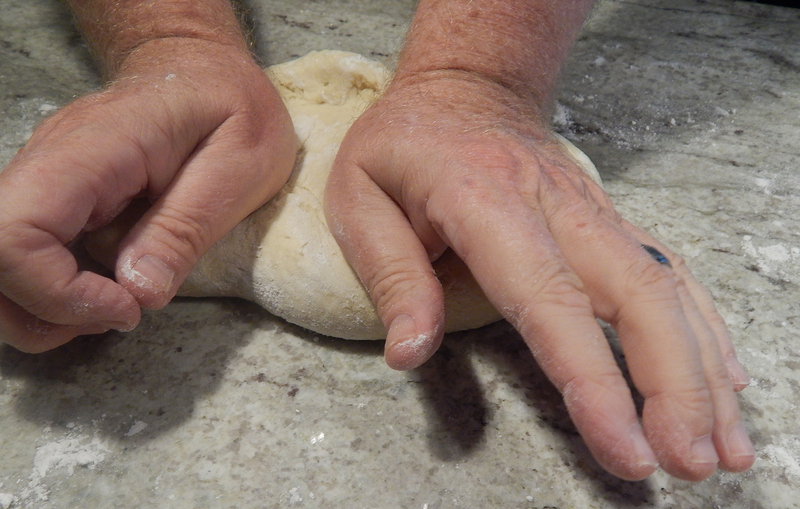 Change attachment to the dough hook and knead at low speed (2) for 2 minutes, adding 1-2 Tbsp of water as necessary. Knead dough on lightly floured countertop, adding flour to prevent sticking, for 2 minutes. 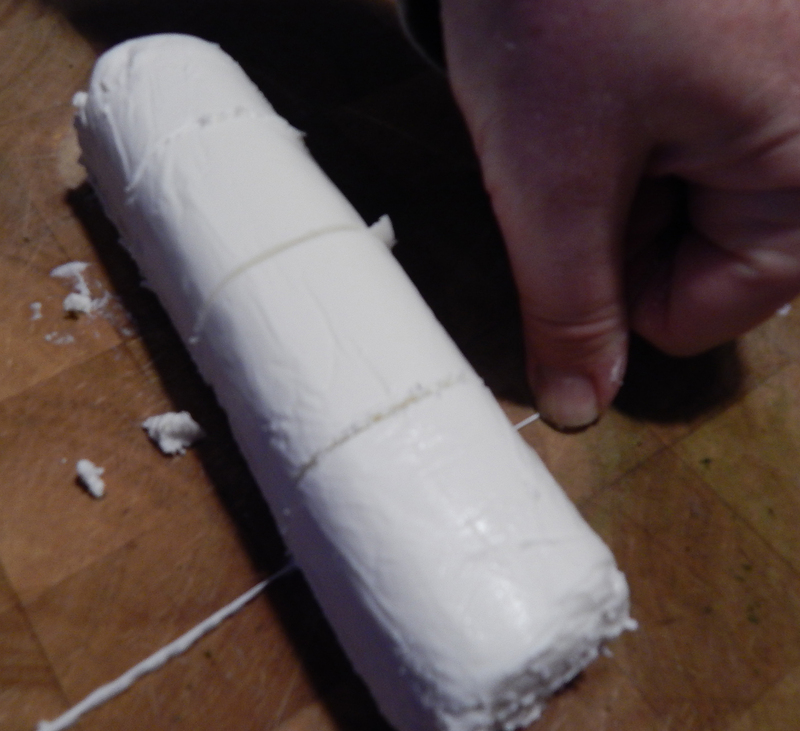 Wrap in plastic and let rest for 20 minutes before rolling out. While not Italy, the night was certainly memorable! Oh, and lest I forget about the very expensive, carefully transported bottle of Vin Santo… Basically a wine that’s left to the saints to make as producers are required to age the wine in sealed casks for a minimum of three years. 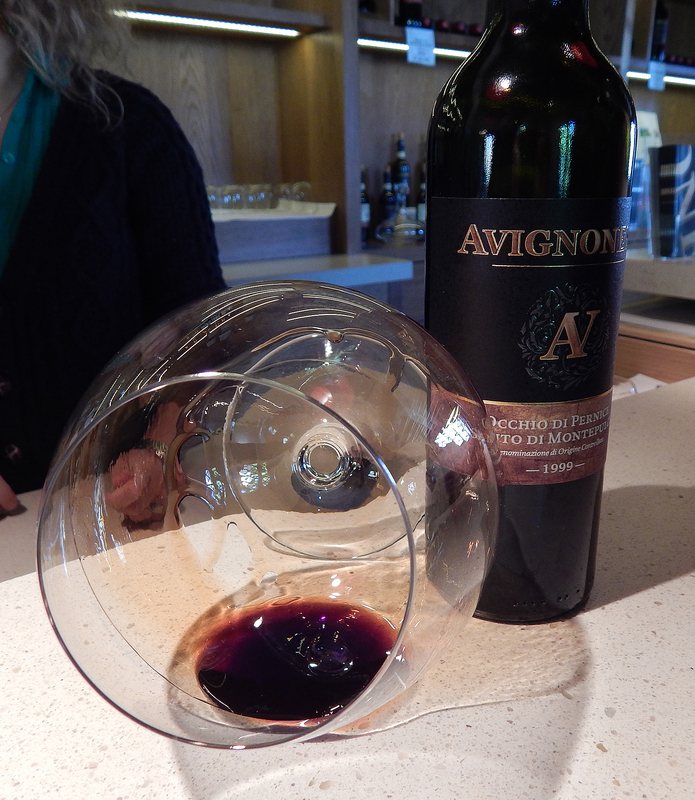 It’s not uncommon for the aging process to last up to 10 years… I think Mike’s purchase from AVIGNONESI (leading winery in the Vino Nobile di Montepulciano area) was aged 12 years. In Tuscany, your biscotti (also called cantucci or cantuccini) would be accompanied by a small glass of Vin Santo for dipping and drinking, perfect accompaniment for our cookies. 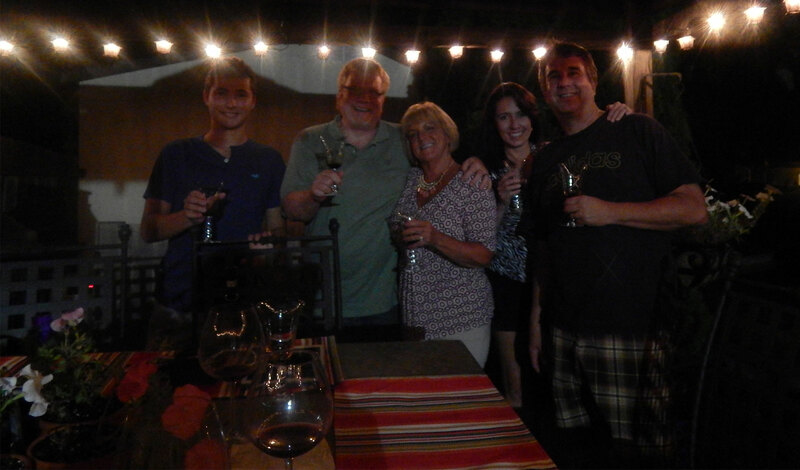 Then, just as Mike was ready to pour us all a small amount (that’s all you need), he dropped the bottle on the patio!! A loud gasp erupted from all, but miraculously, barely a drop was spilt and the bottle remained intact. Crisis averted. 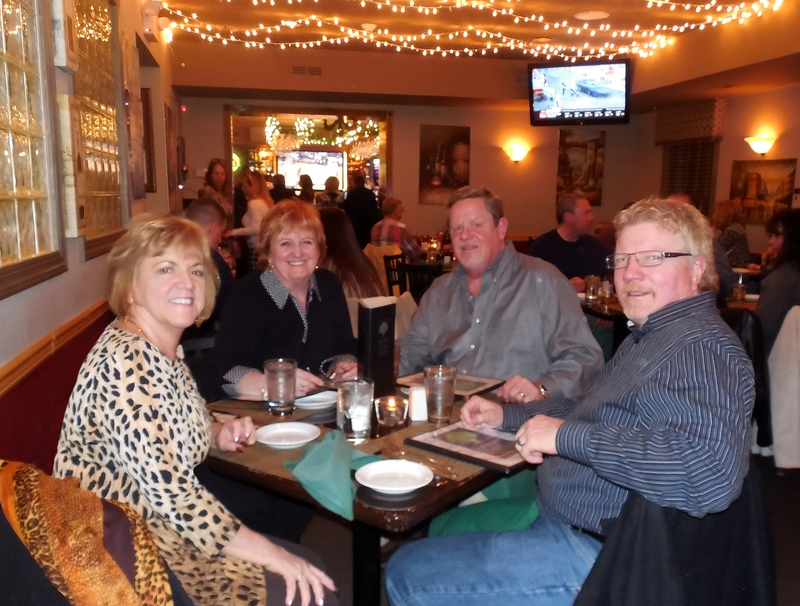 Lynn, Renee and Bob Ruczynski, and Russ having dinner at the Sycamore Grill in Newtown, PA. 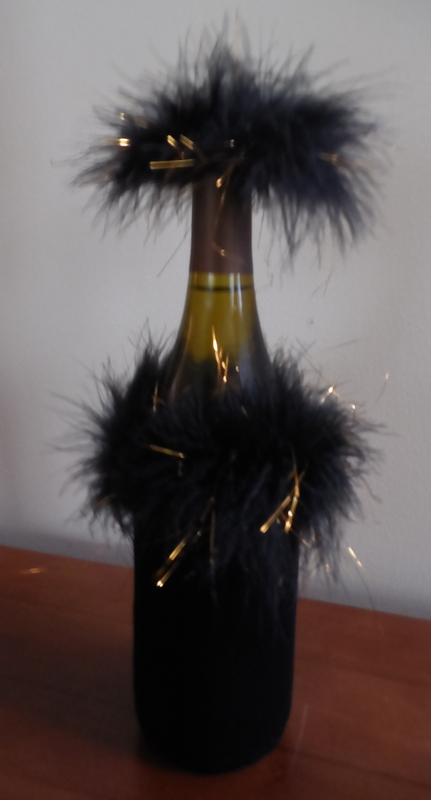 The dolled up bottle of wine, a gift from the Ruczynski’s. Our destination that evening was the Sycamore Grill in Newtown, PA co-owned by other long-ago boating friends Alyson and Joe Feraco. The plan was to meet the Feraco’s at their restaurant, but as often happens in life, something came up and they couldn’t join us. But while we examined the menus, we were offered a round of cocktails on the house — Thanks guys! When we arrived for our 7:30 reservation, the restaurant was fully-booked with a livey atmosphere. In fact, it was almost too loud due to several large parties very near to our table. But once their orders started arriving, the commotion died down, no doubt to savor the luscious entrees now set before them. 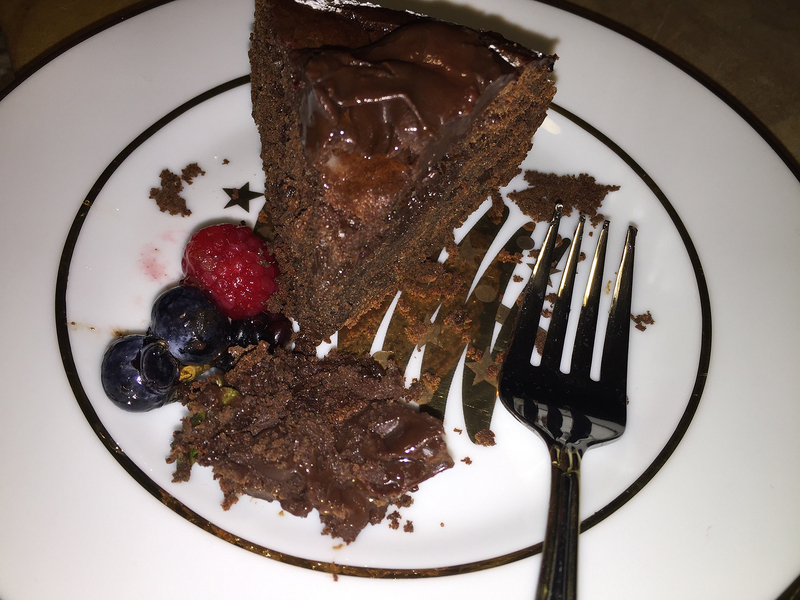 As far as what we ordered, well three of us all zeroed in on the Steak and Cake entree, a 6 oz. Sycamore Filet with a Signature Crab Cake. 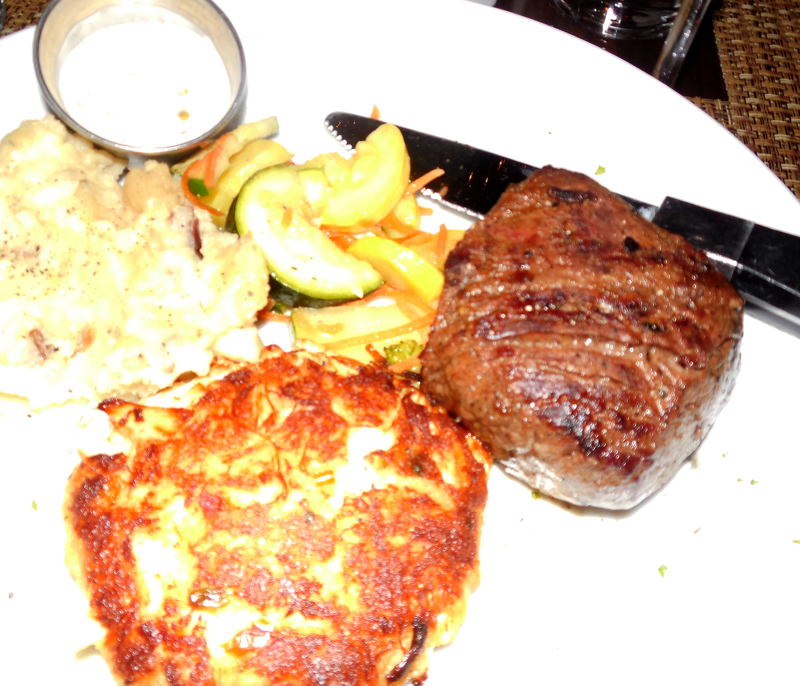 The steak was seared to a perfectly-done medium rare, and the large crab cake was full of flavor — not filler. 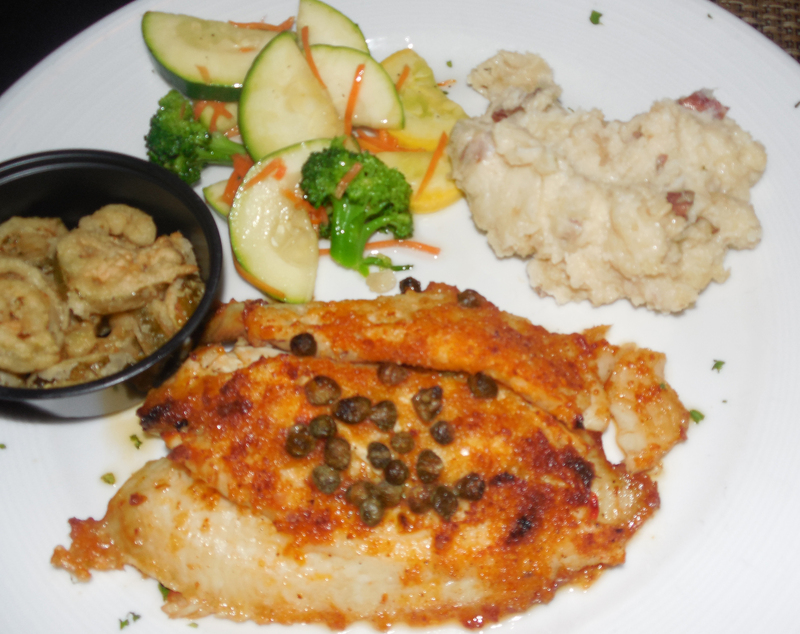 Renee went totally seafood with the Baked Sole Stuffed with Crabmeat with a white wine garlic caper sauce — she was not disappointed. 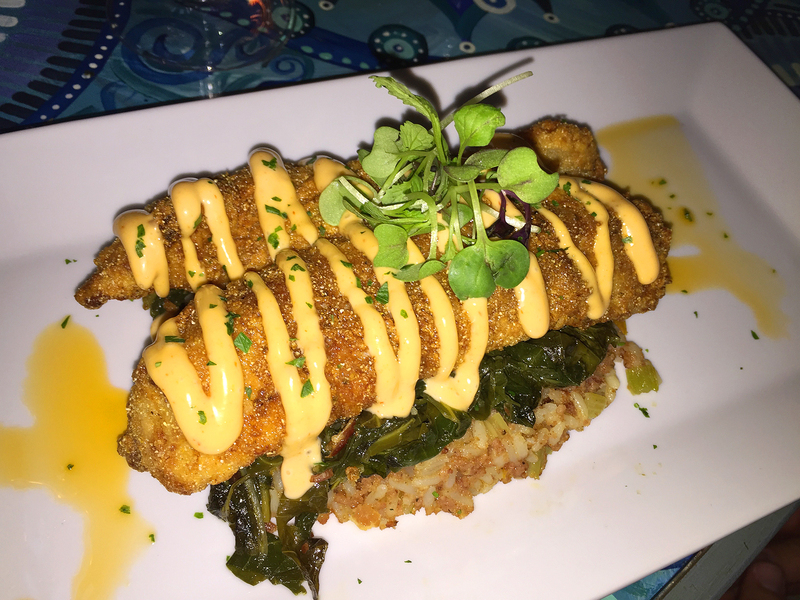 The sole stuffed with crabmeat entree. Three of us enjoyed the steak and cake dinner. Postscript — The next morning, Russ suddenly got a concerned look on his face when the wash machine started making unfamiliar sounds. Just after I unloaded the photos from my camera, I accidentally threw it into the load of laundry. Lo and behold, after fishing out the sopping wet clothes, he found the camera. Guess who just bought a new one?